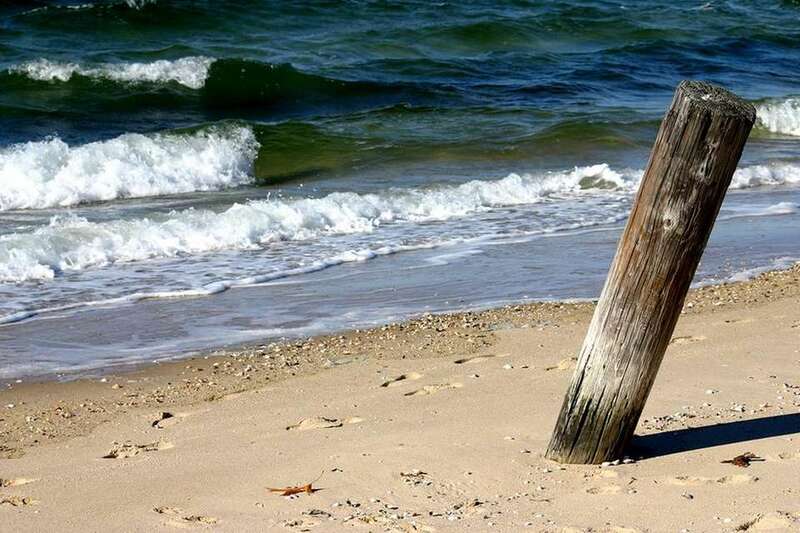 Whether you want to swim, sunbathe or play along miles of fine, white sand or find a quiet spot to surf, fish or look for wildlife, you can dive right in at one of these Long Island beaches. ASHAROKEN BEACH, Asharoken Avenue, Fort Salonga, 631-261-7574. Beach: 535 feet on Northport Bay. Lifeguards: 10 a.m.-6 p.m. May 27-Sept. 4. Boat ramp, small-boat racks, swim lessons (fees for all). Seasonal parking permits for town residents are $40 at beach entrances. Free permits available to 60 and older at Centerport Beach. Without permit, daily parking is $25 for residents, $35 nonresidents. Boat ramps at beaches are for residents only; $30 per boat for season (plus beach permit). ATLANTIC AVENUE BEACH, at end of Atlantic Avenue, off Route 27, Amagansett. Beach: 700 feet on ocean. Lifeguards: Call. Food stand, sand wheelchair, surfing area. 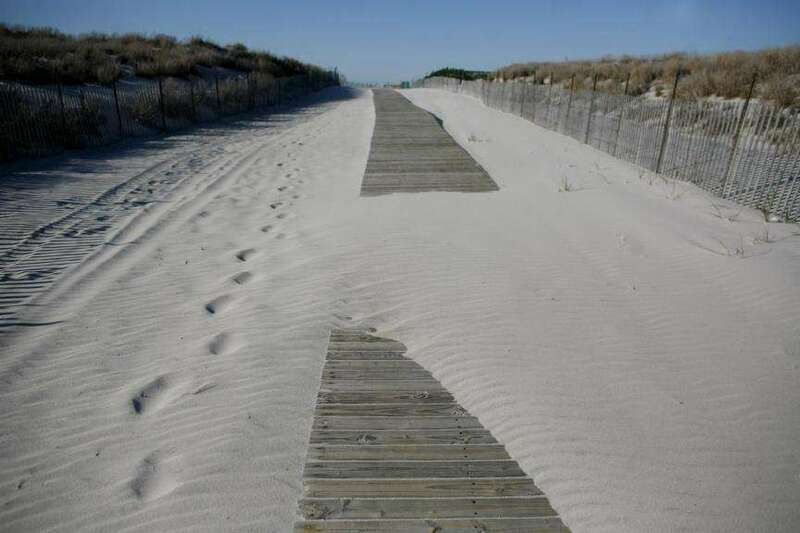 For information on all beaches, call 631-324-2417 or visit ehamptonny.gov. ATLANTIQUE BEACH AND MARINA, Fire Island, 631-583-8610. Beach: Half-mile on ocean; small beach on Great South Bay. Lifeguards: Call. 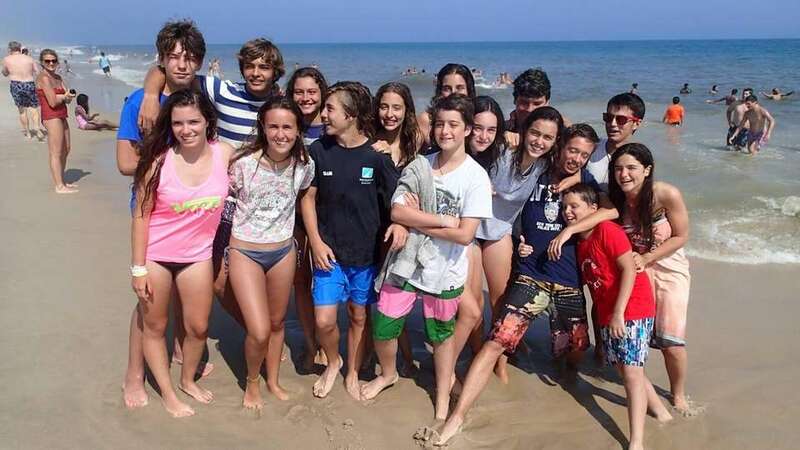 Showers, food stand, marina, playground, surfing area, volleyball, sand wheelchair, picnic and fishing area. Free to Islip residents with a recreation card, disabled town card, or senior ID card. Residents without a card and nonresidents pay a daily fee per car. Residents 13 and older must have an Islip recreation card (call for fees). Resident seniors older than 60 need only a county senior citizen card. For more on the disabled town card, call 631-224-5431. For more about facilities, visit the website islipny.gov, or call the Parks Department at 631-224-5411. No swimming allowed unless a lifeguard is on duty. BAYPORT BEACH, Paulanna Avenue, Bayport, 631-224-5648. Beach: 50 yards on Great South Bay. Lifeguards: Call. New playground, picnic area and fishing dock. Free to Islip residents with a recreation card, disabled town card, or senior ID card. Residents without a card and nonresidents pay a daily fee per car. Residents 13 and older must have an Islip recreation card (call for fees). Resident seniors older than 60 need only a county senior citizen card. For more on the disabled town card, call 631-224-5431. For more about facilities, visit the website islipny.gov, or call the Parks Department at 631-224-5411. No swimming allowed unless a lifeguard is on duty. BENJAMIN BEACH, Clinton Avenue, Bay Shore, 631-224-5778. Beach: On Great South Bay. Lifeguards: Call. Ship Wreck Cove activity pool, playground, picnic area, beach ramp, sand wheelchair, basketball court, showers, food stand, restaurant, marina, fishing dock. Free to Islip residents with a recreation card, disabled town card, or senior ID card. Residents without a card and nonresidents pay a daily fee per car. Residents 13 and older must have an Islip recreation card (call for fees). Resident seniors older than 60 need only a county senior citizen card. For more on the disabled town card, call 631-224-5431. For more about facilities, visit the website islipny.gov, or call the Parks Department at 631-224-5411. No swimming allowed unless a lifeguard is on duty. BIG ALBERT'S LANDING BEACH, At end of Albert's Landing Road, off Old Stone Highway, Amagansett. Beach: 300 feet on Napeague Bay. Lifeguards: Call. Picnic area reservations required, sand wheelchair, restroom. For information on all beaches, call 631-324-2417 or visit ehamptonny.gov. CALLAHAN'S BEACH, at end of Callahans Beach Road, off Route 25A, Fort Salonga. Beach: 300 feet on Smithtown Bay off the Sound. Lifeguards: 9 a.m.-5 p.m. weekends beginning May 27, then daily late June-Labor Day. 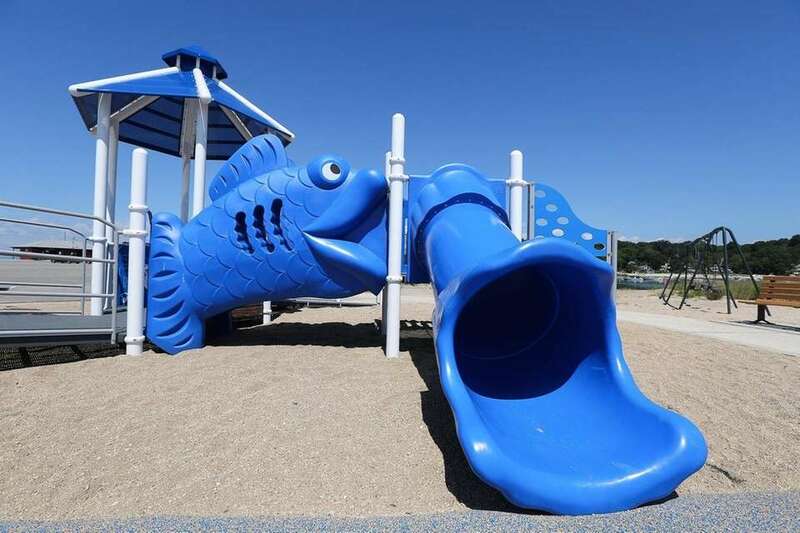 Playground, picnic area, fishing and outside showers. 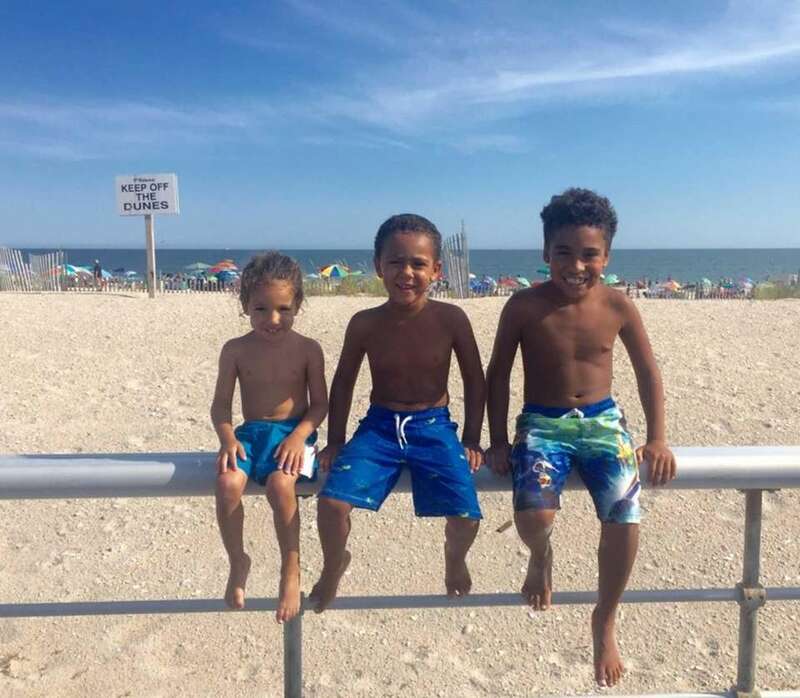 Beaches are for town residents, who can obtain free stickers at Town Hall or the Department of Parks, 100 E. Main St. (Route 25A), Kings Park, and at beaches in season. Call 631-269-1122 or visit smithtownny.gov for more information. CEDAR BEACH AND CEDAR WEST BEACH, Harbor Beach Road, Mount Sinai. Beach: 3,450 feet on the Sound. Lifeguards: 10:30 a.m.-6 p.m. Weekends Memorial Day-Sept. 4. Open 11 a.m.-6 p.m. weekdays June 26-Sept. 4. Fishing pier, nature center, playground, food stand; swim lessons (fee). Resident parking is $5 daily, $15 seasonal ($10 before Memorial Day weekend), $5 for seniors, veterans and handicapped when purchased in advance. Nonresident parking at Sound and bay beaches $20 daily; $100 for week, $250 for season. Ocean beaches are on Fire Island side of Great South Bay and accessible by ferry or boat. For more information, call 631-451-8696 or visit brookhavenny.gov. 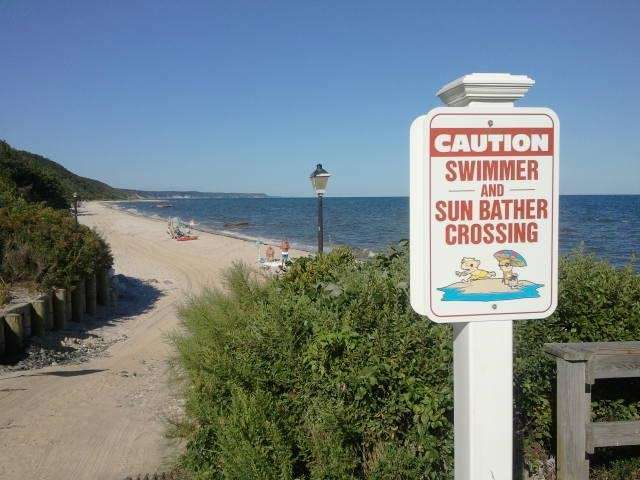 CEDAR BEACH (BABYLON), Ocean Parkway off Wantagh or Robert Moses Parkways, Babylon, 631-893-2100, townofbabylon.com. Beach: ¾ mile on ocean. Lifeguards: 10 a.m.-6 p.m. weekends May 27- June 18, daily 9 a.m.-7 p.m. June 24-Sept. 4. Food stand, showers, basketball and handball courts, volleyball, playground, fishing area, handicapped-accessible fishing dock, surfing areas. Residents can buy an annual recreational pass at Cedar Marina on Ocean Parkway, Phelps Lane Park in North Babylon (May 10-June 23) or Tanner Park in Copiague after June 24; 631-893-2100 or townofbabylon.com for prices and times. CENTERPORT BEACH, off Little Neck Road, 631-261- 7574. Beach: 230 feet on Northport Bay. Lifeguards: 10 a.m.-6 p.m. May 27-Sept. 4. Picnic and pavilion area, playground, shower, car top launching (no motors), boat ramp (fee), swim lessons (fee). 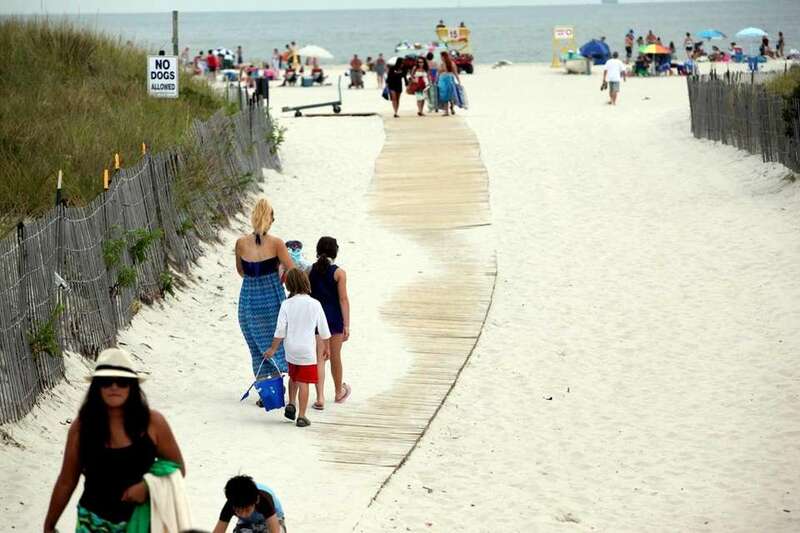 Seasonal parking permits for town residents are $40 at beach entrances. Free permits available to 60 and older at Centerport Beach. Without permit, daily parking is $25 for residents, $35 nonresidents. Boat ramps at beaches are for residents only; $30 per boat for season (plus beach permit). CENTRE ISLAND BEACH, off Bayville-Centre Island Road, Bayville, 516-624-6123, oysterbaytown.com. 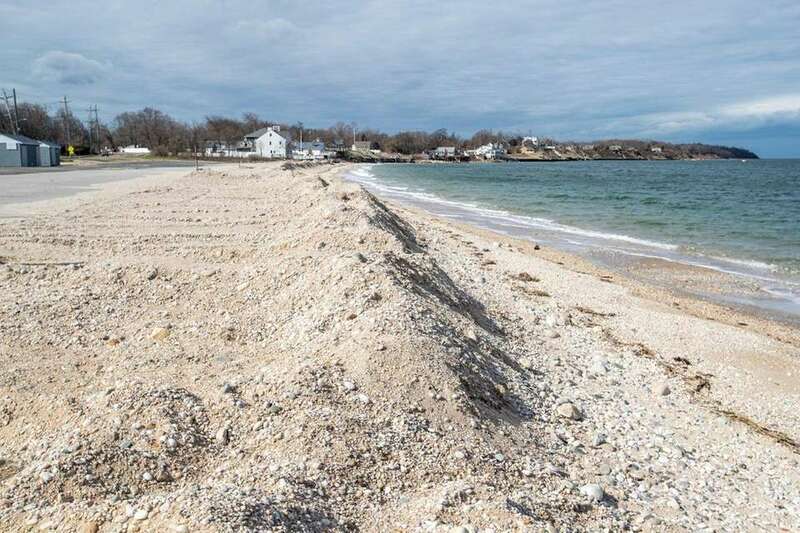 Beach: 350 feet on Oyster Bay Harbor, 650 feet on Long Island Sound. Lifeguards: 9 a.m.-5 p.m. weekends and holidays May 27-June 18, daily June 24- Sept. 4. Outdoor showers. Town residents only. For fees, call the Beach Division at 516-797-4110 or check website. CHARLES E. RANSOM BEACH, off Bayville Avenue, Bayville, 516-624-6160, oysterbaytown.com. Beach: 800 feet on Sound. Lifeguards: No lifeguards or swimming. Long Island Sound overlook, playground. Open to all. For fees, call the Beach Division at 516-797-4110 or check website. COOPERS BEACH, 268 Meadow Lane, Southampton, 631-283-0247. Beach: 500 feet on the ocean. Lifeguards: 9 a.m.-5 p.m. weekends, Memorial Day to June 24, daily June 25-Labor Day. Fee Drop-off free, permit or day pass required for parking. 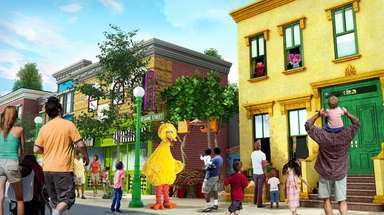 $40 a day nonresidents; summer nonresident visitor pass $350 for the season. Concession stand, bathrooms, showers, chair and umbrella rentals. COREY BEACH, Corey Avenue, Blue Point. Beach: 500 feet on Great South Bay. 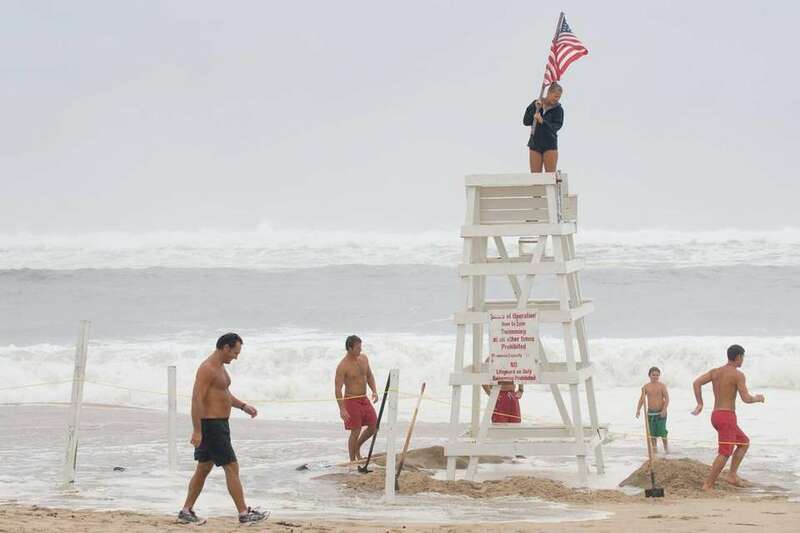 Lifeguards: 10:30 a.m.- 6 p.m. weekends Memorial Day-Sept. 4. Open 11 a.m.-6 p.m. weekdays June 26-Sept. 4. Food stand, playground; swim lessons (fee). Resident parking is $5 daily, $15 seasonal ($10 before Memorial Day weekend), $5 for seniors, veterans and handicapped when purchased in advance. Nonresident parking at Sound and bay beaches $20 daily; $100 for week, $250 for season. Ocean beaches are on Fire Island side of Great South Bay and accessible by ferry or boat. For more information, call 631-451-8696 or visit brookhavenny.gov. CRAB MEADOW BEACH, off Waterside Avenue, Northport, 631-261-7574. Beach: 1,060 feet on the Sound. Lifeguards: 10 a.m.-6 p.m. May 27-Sept. 4. Picnic and pavilion area, playground, restaurant, snack bar, boardwalk, outdoor shower, car top launching (no motors), beach wheelchair. Seasonal parking permits for town residents are $40 at beach entrances. Free permits available to 60 and older at Centerport Beach. Without permit, daily parking is $25 for residents, $35 nonresidents. 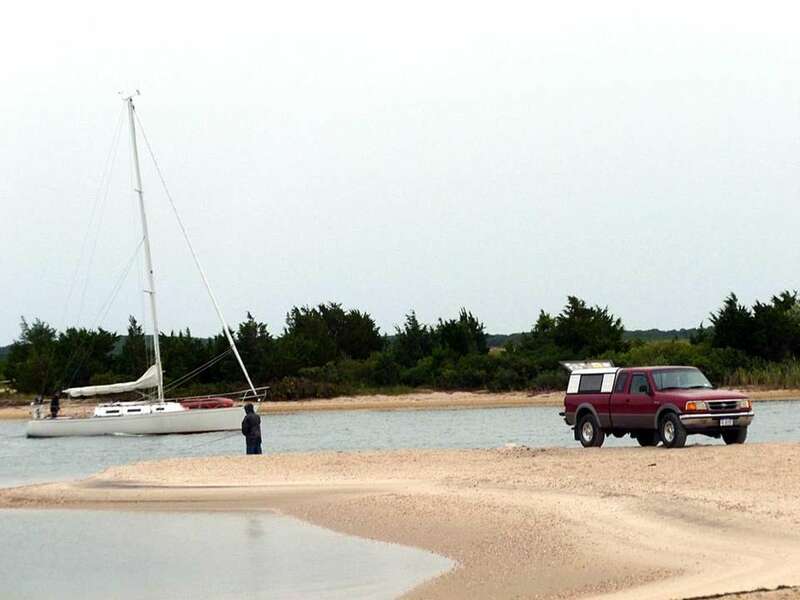 Boat ramps at beaches are for residents only; $30 per boat for season (plus beach permit). CRESCENT BEACH, off Crescent Beach Drive, Huntington, 631-261-7574. Lifeguards: 10 a.m.-6 p.m. Weekends May 27-June 25, daily June 26-Aug. 1. Seasonal parking permits for town residents are $40 at beach entrances. Free permits available to 60 and older at Centerport Beach. Without permit, daily parking is $25 for residents, $35 nonresidents. Boat ramps at beaches are for residents only; $30 per boat for season (plus beach permit). CRESCENT BEACH, Shore Road off West Neck Road. Beach: 600 feet on Shelter Island Sound. Lifeguards: 10 a.m.-5 p.m. June 15-Labor Day. Parking permit required. 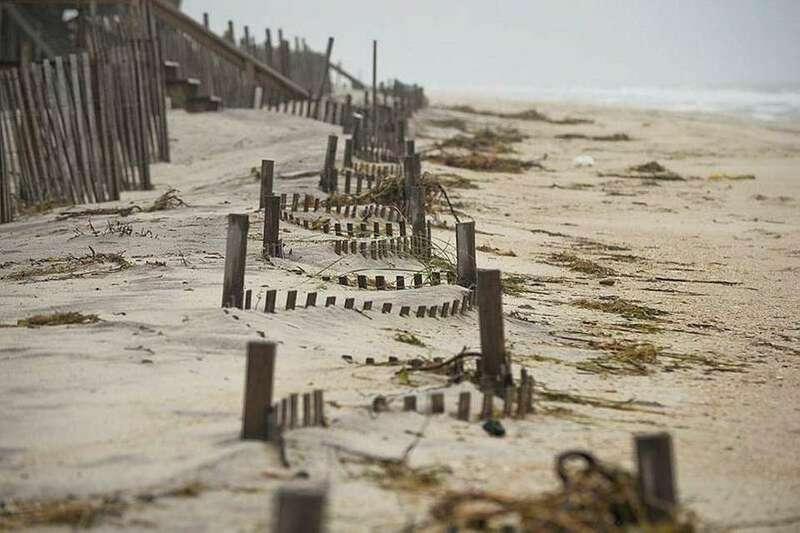 Beach parking restricted to residents, renters and hotel guests. Ten passes can be issued each day for nonresidents for Shell Beach and Wades Beach only. All vehicles parked at beaches must display a parking permit May 26-Sept. 4. Parking permits are available at the town clerk's office Mon.-Fri., 9 a.m.-4 p.m., and Sat. mornings, 9-noon, June 17-Aug. 26. Day passes $25 per vehicle; weekly permits $50 per vehicle; monthly permits $95 per vehicle; season permits $230 per vehicle; 631-749-1166, shelterislandtown.us or email townclerk@shelterislandtown.us. CUPSOGUE BEACH COUNTY PARK, Dune Road, Westhampton, suffolkcountyny.gov/parks, 631- 852-8111. Beach: 1 mile on Moriches Inlet. Lifeguards: 8:30 a.m.-4:30 p.m. June 17-Sept. 4. Beach wheelchair, restrooms, snack bar; camping on bay side, off-road vehicles require permit. Fee: $9 with Suffolk County Green Key card, $18 without card. DAVIS PARK, opposite Patchogue, Fire Island. Beach: 800 feet on ocean. Lifeguards: 10:30 a.m.-5 p.m. Weekends Memorial Day-June 25; daily June 26-Sept. 4. Reached by Davis Park Ferry at Sandspit Beach or private boat. Restrooms. Resident parking is $5 daily, $15 seasonal ($10 before Memorial Day weekend), $5 for seniors, veterans and handicapped when purchased in advance. Nonresident parking at Sound and bay beaches $20 daily; $100 for week, $250 for season. Ocean beaches are on Fire Island side of Great South Bay and accessible by ferry or boat. For more information, call 631-451-8696 or visit brookhavenny.gov. DITCH PLAINS, Off Ditch Plains Road, Montauk. Beach: 500 feet on ocean; popular with surfers. Lifeguards: Call. Food stand, sand wheelchair, restrooms. For information on all beaches, call 631-324-2417 or visit ehamptonny.gov. EAST ISLIP BEACH, Bayview Avenue, East Islip, 631-224-5404. Beach: 50 yards on Great South Bay. Lifeguards: Call. Outside showers, playground, picnic area, fishing dock, kayak and paddleboard camp and lessons (fee). Free to Islip residents with a recreation card, disabled town card, or senior ID card. Residents without a card and nonresidents pay a daily fee per car. Residents 13 and older must have an Islip recreation card (call for fees). Resident seniors older than 60 need only a county senior citizen card. For more on the disabled town card, call 631-224-5431. For more about facilities, visit the website islipny.gov, or call the Parks Department at 631-224-5411. No swimming allowed unless a lifeguard is on duty. EUGENE NICKERSON BEACH, 880 Lido Blvd., Lido Beach, 516-571-7700, nassaucountyny.gov. Beach: Half-mile on ocean. Lifeguards: mid-June to Labor Day. Cabanas, 2 pools (fee), 2 tennis courts, soccer fields (fee), basketball court, playgrounds, handball and paddleball, snack bars, 74 campsites for RVs and 13 campsites for tents (fee), picnic area (reservation), surf casting (permit required), skate park, recreation program for ages 5-12, register by May 26, 516-572-0245. Fee: $30 with Leisure Pass, available to Nassau residents, parking $12 a day Memorial Day-Labor Day; without pass, $35. For more, see County Parks. 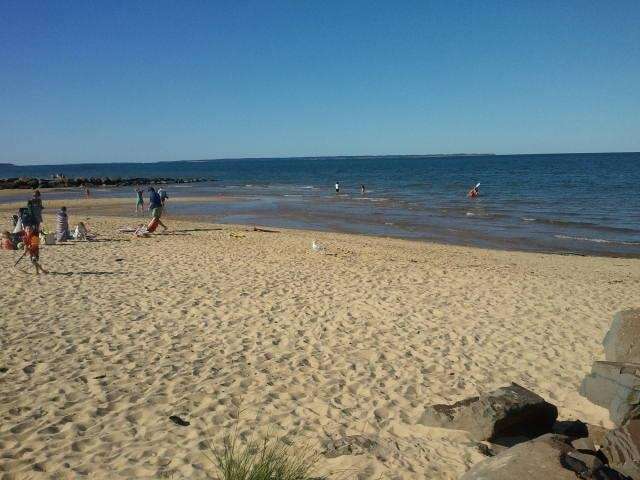 FLEETS COVE BEACH, off Fleets Cove Road, Huntington, 631-261-7574. Beach: 1,600 feet on Centerport Harbor. Lifeguards: 10 a.m.-6 p.m. May 27-Sept. 4. Playground, shower, small-boat racks (fee). Seasonal parking permits for town residents are $40 at beach entrances. 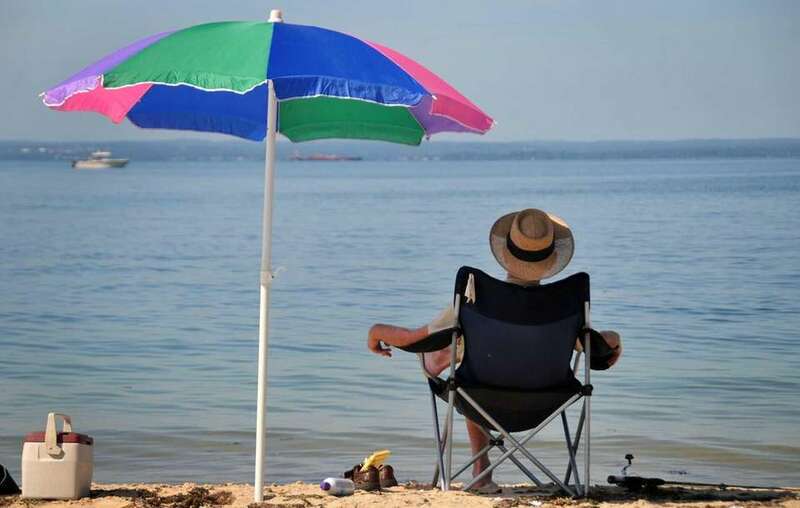 Free permits available to 60 and older at Centerport Beach. Without permit, daily parking is $25 for residents, $35 nonresidents. Boat ramps at beaches are for residents only; $30 per boat for season (plus beach permit). FLYING POINT BEACH, on Flying Point Road, Water Mill. Beach: 250 feet on ocean. Lifeguards: 10 a.m.- 5 p.m. daily June 25-Sept. 5. Showers, restrooms, food stand, volleyball. Open only to seasonal permit holders, including nonresidents. Beachgoers must obtain parking permits, sold 10 a.m.-2 p.m. Mon.-Fri. until June 24 at Town Hall, 116 Hampton Rd., Southampton. 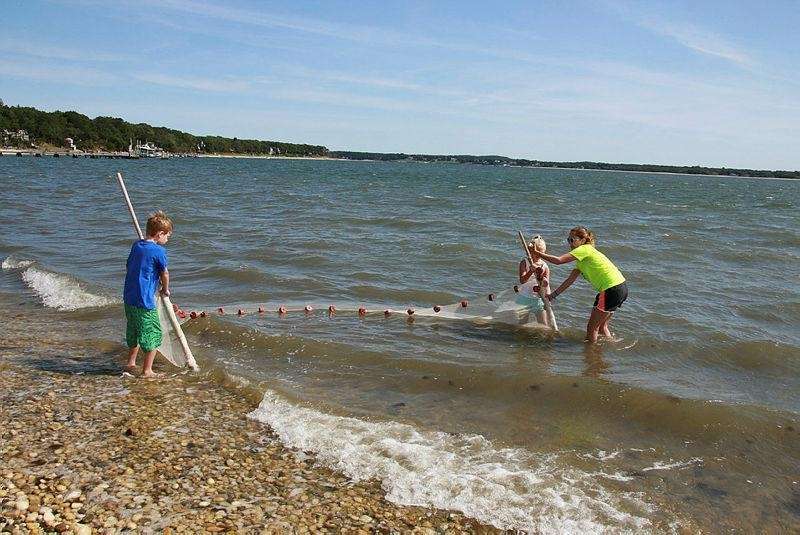 Also sold at the Parks and Recreation office, 6 Newton Rd., Hampton Bays, 8:30 a.m.-4 p.m. Mon.-Fri.; and daily beginning June 25 at town beaches. Seasonal fee is $40 for residents, $25 for residents older than 60 and $375 for nonresidents. 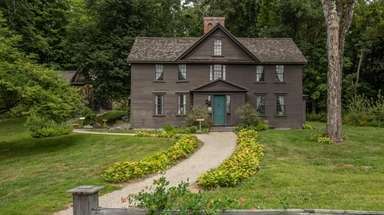 For more information, call 631-728-8585 or visit southamptontownny.gov. 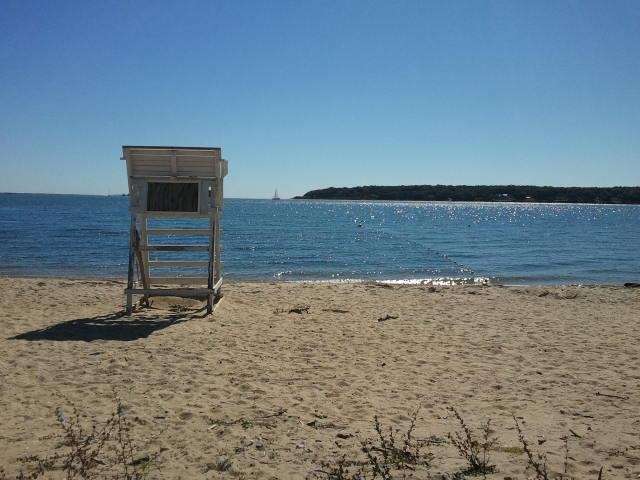 FOSTER MEMORIAL BEACH, 1000 Long Beach Rd., Sag Harbor. Beach: 1 mile on Peconic Bay. Lifeguards: 10 a.m.-5 p.m. daily June 25-Sept. 5. Showers, benches, food stand, overlook platform, sand wheelchair, restrooms. Open only to seasonal permit holders, including nonresidents. Beachgoers must obtain parking permits, sold 10 a.m.-2 p.m. Mon.-Fri. until June 24 at Town Hall, 116 Hampton Rd., Southampton. Also sold at the Parks and Recreation office, 6 Newton Rd., Hampton Bays, 8:30 a.m.-4 p.m. Mon.-Fri.; and daily beginning June 25 at town beaches. Seasonal fee is $40 for residents, $25 for residents older than 60 and $375 for nonresidents. For more information, call 631-728-8585 or visit southamptontownny.gov. GEORGICA BEACH, at end of Apaquogue Road and Lily Pond Lane, 631-324-4150, easthamptonvillage. org/beaches.htm. Beach: 300 feet on ocean. Lifeguards: 10 a.m.-5 p.m. weekends May 27- June 24, then daily through Sept. 4, then weekends only through mid-Sept. Restrooms. Seasonal parking permits: free for residents; sold out for nonresidents this year. Daily parking: $40 Mon.-Fri., except holidays, available only at Georgica and Main beaches. Weekend and holiday parking spaces limited to 40 at Georgica. Permits issued at Main Beach in season and Village Hall (weekdays). 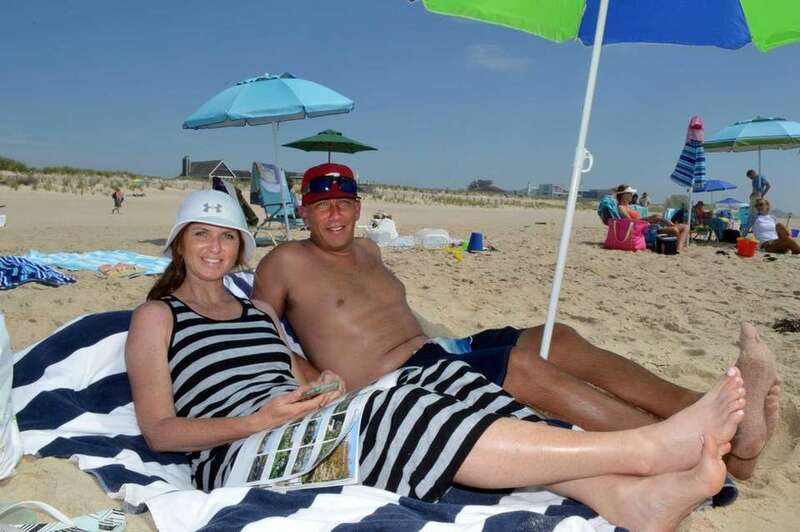 GILGO BEACH, Ocean Parkway, Babylon, 631-893-2100, townofbabylon.com Beach 7 miles on ocean. Lifeguards 10 a.m.-6 p.m. weekends May 27-June 18, daily 9 a.m.-7 p.m. June 24-Sept 4. Surfing, fishing, handicapped-accessible fishing docks, food stand, picnic area, playground, surf lessons, volleyball, basketball, marina.Residents can buy an annual recreational pass at Cedar Marina on Ocean Parkway, Phelps Lane Park in North Babylon (May 10-June 23) or Tanner Park in Copiague after June 24; 631-893-2100 or townofbabylon.com for prices and times. GIN BEACH / EAST LAKE DRIVE BEACH, Off Route 27 end of East Lake Drive, Montauk. Beach: 300 feet on Block Island Sound. Lifeguards: Call. Food stand, restrooms. For information on all beaches, call 631-324-2417 or visit ehamptonny.gov. GOLD STAR BATTALION BEACH, off West Shore Road, Huntington, 631-261-7574. Beach: 400 feet on bay. Lifeguards: 10 a.m.-6 p.m. daily May 27-Sept. 4. Playground, shower, small-boat rack (fee). Seasonal parking permits for town residents are $40 at beach entrances. 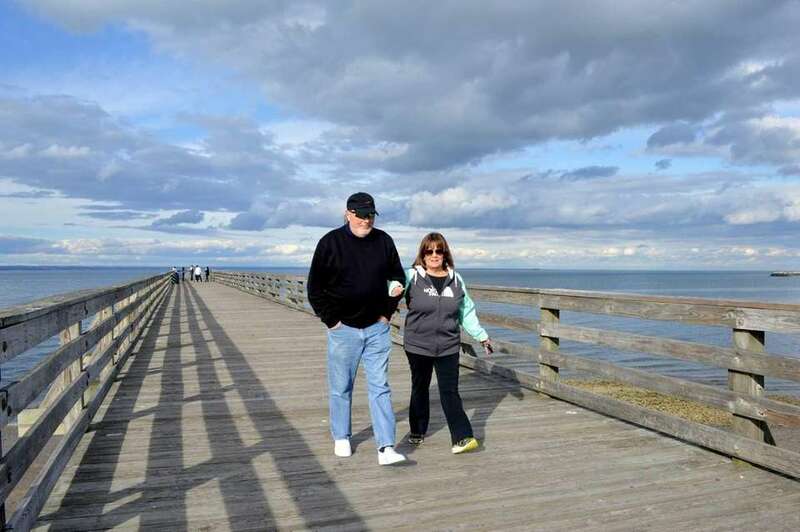 Free permits available to 60 and older at Centerport Beach. Without permit, daily parking is $25 for residents, $35 nonresidents. Boat ramps at beaches are for residents only; $30 per boat for season (plus beach permit). GOV. ALFRED E. SMITH/SUNKEN MEADOW STATE PARK, at north end of Sunken Meadow State Parkway, Kings Park, 631-269-4333, nysparks.com. Beach: 3 miles on Smithtown Bay and Sound. Lifeguards: Call for hours. Swimming, beach ramp and sand wheelchair available, picnic area, golf course, biking and running trails, fishing (night fishing to Dec. 31), first aid station during swimming season. Fee $10 a car May 27-Labor Day, $8 weekends and holidays, April 1-May 21 and Sept. 9- Nov. 12. For more park amenities, see State Parks. GREAT GUN, Opposite Center Moriches, Fire Island. Beach: 800 feet on ocean. Lifeguards: 10:30 a.m.- 5 p.m. July 1-4, then Thur.-Mon. (closed Tues.-Wed.)July 6- Sept. 4. Reached by private boat or 4-wheel drive vehicles only. Restrooms. Resident parking is $5 daily, $15 seasonal ($10 before Memorial Day weekend), $5 for seniors, veterans and handicapped when purchased in advance. Nonresident parking at Sound and bay beaches $20 daily; $100 for week, $250 for season. Ocean beaches are on Fire Island side of Great South Bay and accessible by ferry or boat. For more information, call 631-451-8696 or visit brookhavenny.gov. 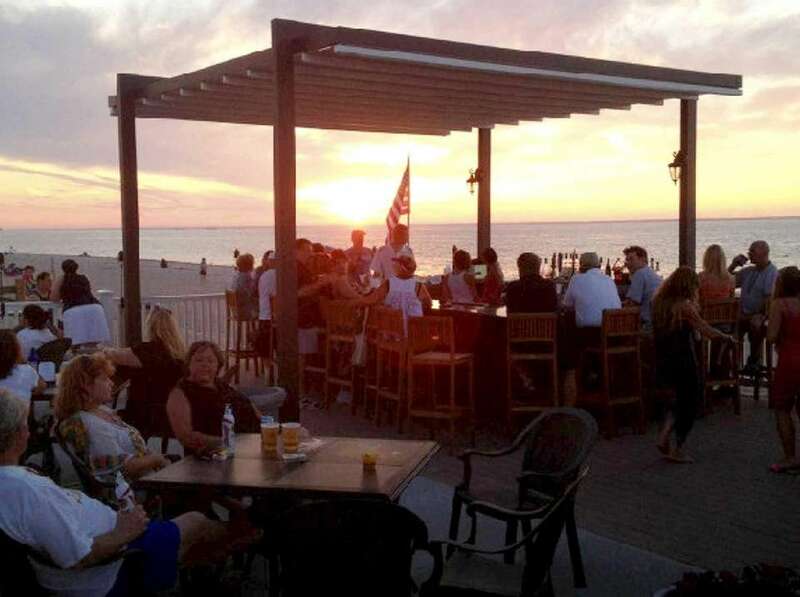 HARRY TAPPEN BEACH, Shore Road, Glenwood Landing, 516-674-7100, oysterbaytown.com. Lifeguards: 9 a.m.-5 p.m. daily, June 24-Sept. 4. Bathing in Hempstead Harbor, restaurant, picnic area. For fees, call the Beach Division at 516-797-4110 or check website. 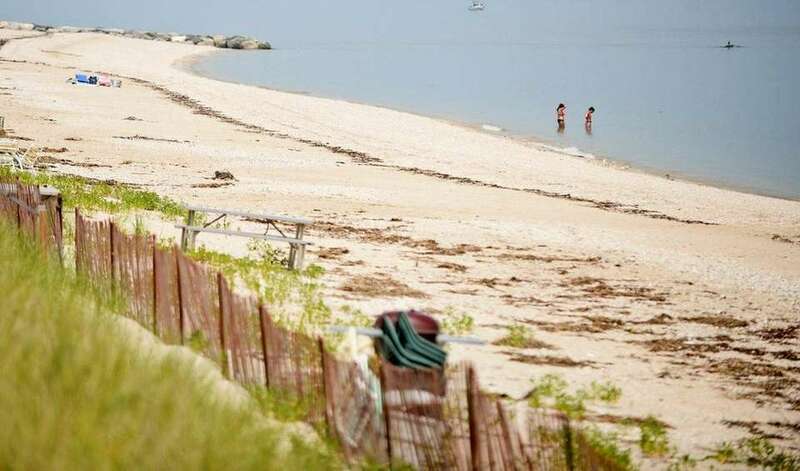 HECKSCHER STATE PARK, take Southern State Parkway east to south end of Heckscher Parkway, East Islip, 631-581-2100, nysparks.com. Season: All year. Beach: 1.2 miles on Great South Bay. Lifeguards: June 24-Labor Day; call for hours. 2 beach areas. Fee: $8 a car weekends April 1-May 21 and daily May 27-June 23; $10 daily June 24-Labor Day; $8 a car weekends Sept. 9-Oct. 9. For more details, see State Parks. HITHER HILLS STATE PARK, 164 Old Montauk Hwy. (Route 27), 4 miles west of hamlet of Montauk. Season: All year, sunrise-sunset. 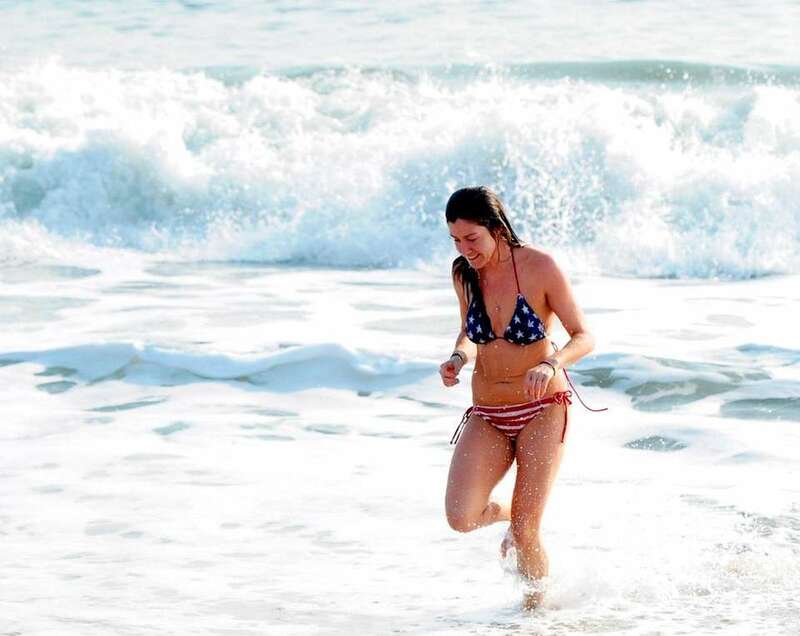 Beach: 2 1⁄2 miles on ocean. Lifeguards: Call for hours. Three sand chairs, playground, 2 picnic areas, general store (hours vary). 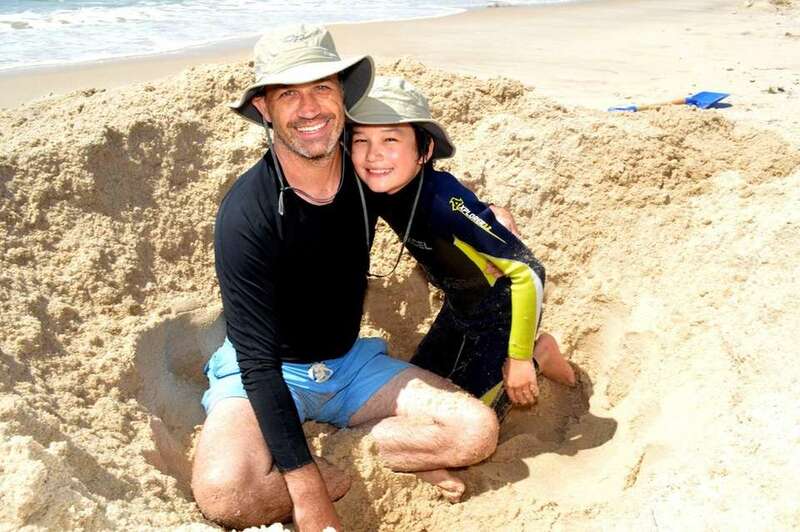 Sand castle contests 9:30 a.m. Thursdays June 29-Aug. 24. Fee: $10 a car daily May 27-Sept. 10. For more, see State Parks. HOBART BEACH, off Eatons Neck Road, Eatons Neck, 631-261-7574. Beach: 1,725 feet on Huntington Bay. Lifeguards: May 27-Sept. 4, daily 10 a.m.- 6 p.m. Boat ramp (fee), playground, showers. Seasonal parking permits for town residents are $40 at beach entrances. Free permits available to 60 and older at Centerport Beach. Without permit, daily parking is $25 for residents, $35 nonresidents. Boat ramps at beaches are for residents only; $30 per boat for season (plus beach permit). INDIAN WELLS BEACH, At end of Indian Wells Highway, Amagansett. Beach: 700 feet on ocean. Lifeguards: Call. Food stand, surfing area. For information on all beaches, call 631-324-2417 or visit ehamptonny.gov. IRON PIER BEACH, Pier Avenue, off Sound Avenue, Jamesport. Beach: 480 feet on the Sound. Lifeguards: 10 a.m.- 5 p.m. weekends May 27-June 25, then daily June 26-Sept. 4. Boat ramp (restrictions, so call ahead), showers, playground, bathhouse, snack shack (hours vary), swim lessons (fee). 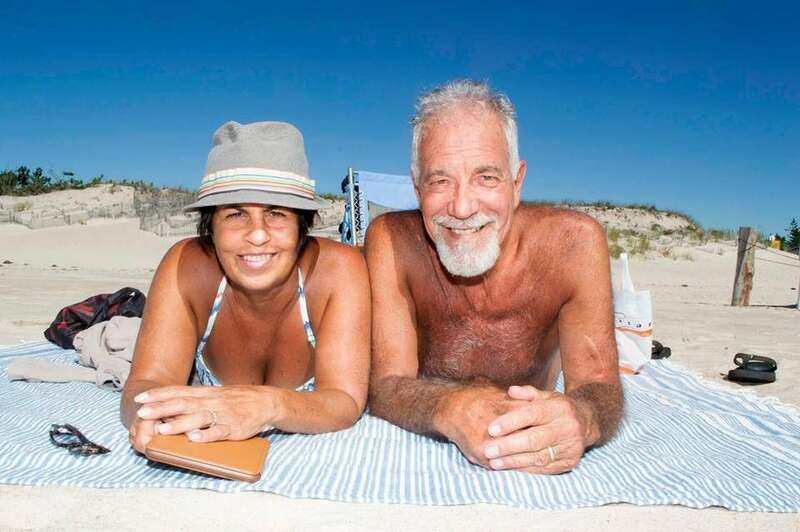 Town residents pay a seasonal $15 fee ($5 seniors) for a beach permit. Nonresidents pay $200 seasonally or $35 per vehicle per day. Buy stickers at Recreation Department or beach entrances. Details: riverheadrecreation.net or 631-727-4444; proof of residency required. 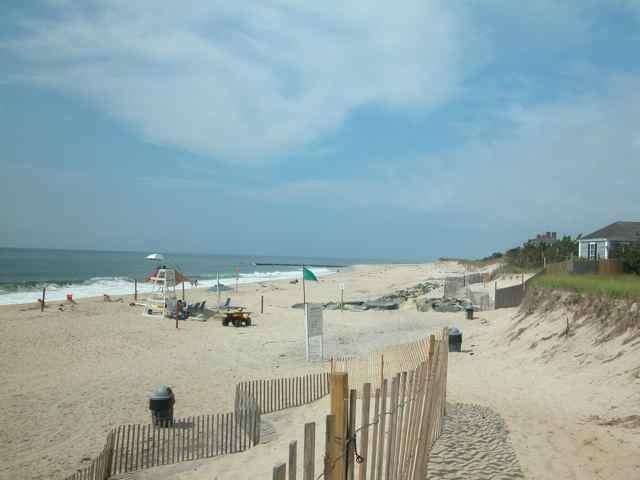 ISLIP TOWN BEACH, South Bay Avenue, Islip, 631-224-5345 Beach: 150 yards on Great South Bay. Lifeguards: Call. Showers, playground, sand wheelchair, picnic area, food stand. Free to Islip residents with a recreation card, disabled town card, or senior ID card. Residents without a card and nonresidents pay a daily fee per car. Residents 13 and older must have an Islip recreation card (call for fees). Resident seniors older than 60 need only a county senior citizen card. For more on the disabled town card, call 631-224-5431. For more about facilities, visit the website islipny.gov, or call the Parks Department at 631-224-5411. No swimming allowed unless a lifeguard is on duty. 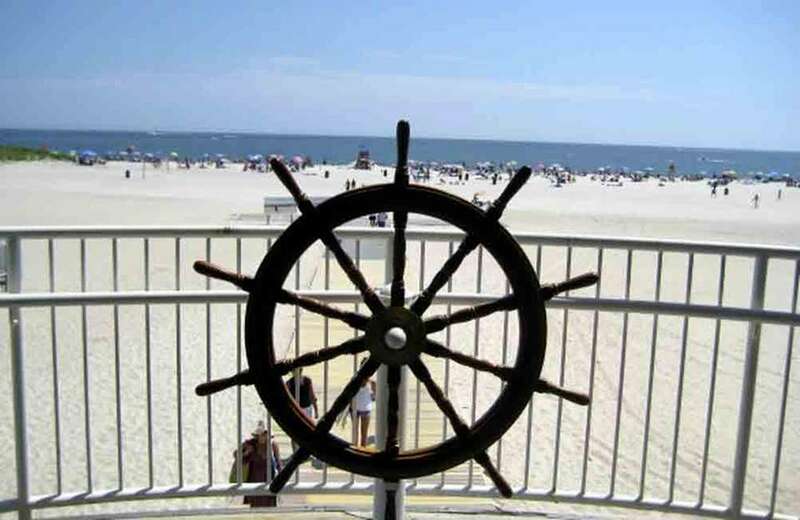 JONES BEACH STATE PARK, 2400 Ocean Pkwy., Wantagh, 516-785-1600, nysparks.com. Beach: 6 1⁄2 miles on ocean; part of a 2,413-acre park, 2-mile boardwalk, bathhouses, beach shops, refreshment stands, recreation areas and more. Lifeguards: May 26-Sept. 17. Fee: $10 a car daily May 26-Sept. 4; $8 weekends and holidays April 1-May 21 and Sept. 16-Nov. 5. For more, see story on Page 31. KIRK PARK BEACH, Off Route 27 just west of Montauk village. Beach: 500 feet on the ocean. Lifeguards: Call. Picnic area across from beach, restrooms. For information on all beaches, call 631-324-2417 or visit ehamptonny.gov. LIDO BEACH, 630 Lido Blvd., Lido Beach, 516-431-6650, toh.li/facilities/beaches-and-pools/beaches. Beach: 1,554 feet. Lifeguards: 10 a.m.-6 p.m. weekends May 27-June 18 then daily June 19-Sept. 4. Outdoor showers, basketball, The Mushrooms picnic area and tables (by permit only), playground, tennis, bocce, shuffleboard, paddleboard, volleyball courts, wheelchair platform. Fee: $10 for town residents with proof of residency, $25 for nonresidents ($20 for nonresidents at Lido Beach Town Park). LONG BEACH, Long Beach Road, off Moriches Road, Nissequogue. Beach: 300 feet on Smithtown Bay. Lifeguards: 9 a.m.-5 p.m. weekends beginning May 27, then daily late June-Labor Day. Boat ramp, marina, pavilion, fishing, food stand, showers, sailing and motorboats, windsurf lessons (fee). 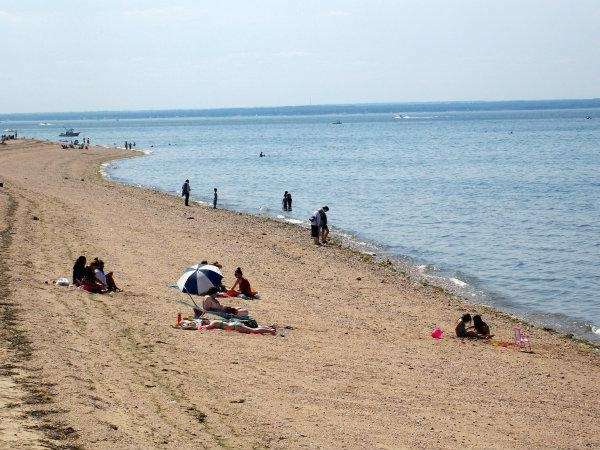 Beaches are for town residents, who can obtain free stickers at Town Hall or the Department of Parks, 100 E. Main St. (Route 25A), Kings Park, and at beaches in season. Call 631-269-1122 or visit smithtownny.gov for more information. MAIDSTONE PARK, At end of Flaggy Hole Rd. off Three Mile Harbor Rd. and Hog Creek Hwy., East Hampton. Beach: 400 feet on Gardiners Bay. Lifeguards: Call. Picnic areas require reservation, ballfield, pavilion, restrooms; park has its own little cove and secret nooks. For information on all beaches, call 631-324-2417 or visit ehamptonny.gov. MAIN BEACH, at end of Ocean Avenue off Montauk Highway, easthamptonvillage.org/beaches.htm, 631-324-0074. Beach: 300 feet on ocean. Lifeguards: 10 a.m.-5 p.m. weekends only May 27-June 30, then daily through Sept. 4, then weekends only through mid-Sept. Food stand, beach pavilion, lockers (sold out), showers and restrooms. Seasonal parking permits: free for residents; sold out for nonresidents this year. Daily parking: $40 Mon.-Fri., except holidays, available only at Georgica and Main beaches. Weekend and holiday parking spaces limited to 40 at Georgica and 60 at Main Beach. Permits issued at Main Beach in season and Village Hall (weekdays). MECOX BEACH, On Jobs Lane, Bridgehampton. Beach: 250 feet on ocean. Lifeguards: 10 a.m.- 5 p.m. daily June 25-Sept. 5. Snack carts, restrooms, volleyball courts and a deck. Open only to seasonal permit holders, including nonresidents. Beachgoers must obtain parking permits, sold 10 a.m.-2 p.m. Mon.-Fri. until June 24 at Town Hall, 116 Hampton Rd., Southampton. Also sold at the Parks and Recreation office, 6 Newton Rd., Hampton Bays, 8:30 a.m.-4 p.m. Mon.-Fri.; and daily beginning June 25 at town beaches. Seasonal fee is $40 for residents, $25 for residents older than 60 and $375 for nonresidents. For more information, call 631-728-8585 or visit southamptontownny.gov. 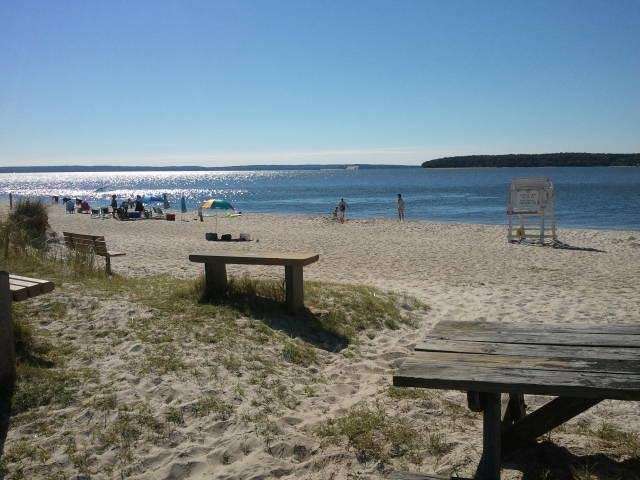 MESCHUTT BEACH COUNTY PARK, 1 Canal Rd., Hampton Bays, suffolkcountyny.gov/parks, 631-852-8205. Beach: 1,000 feet on Peconic Bay. Lifeguards: June 24-Sept. 4, 10 a.m.-5:30 p.m. Picnic area, playground, snack area, showers, restrooms, sand wheelchair, limited camping. Fee: $9 with Green Key card, $18 without card. MORGAN MEMORIAL PARK BEACH, On Germaine Street, at end of Landing Road, Glen Cove. Beach: 350 feet on the Sound. Lifeguards: 10 a.m.- 6 p.m. weekends May 27-June 18, daily June 19- Sept. 4. Picnic area, food concession, half-mile hiking trail, beach ramps. Concerts summer evenings and July 4: morganparkmusic.org. Fee: Free. NEW SUFFOLK BEACH, on First Street, off New Suffolk Avenue and Main Street, New Suffolk. Beach: 200 feet on Peconic Bay. Lifeguards: 11 a.m.-5 p.m. daily June 24-Sept. 4. Boat ramp (with parking permit), playground; beach is popular with windsurfers. Annual parking permit $10 for town residents, available at Town Hall, 8 a.m.-4 p.m. weekdays or by mail, or at southoldtownny.gov, $150 for nonresidents, available at Town Hall. 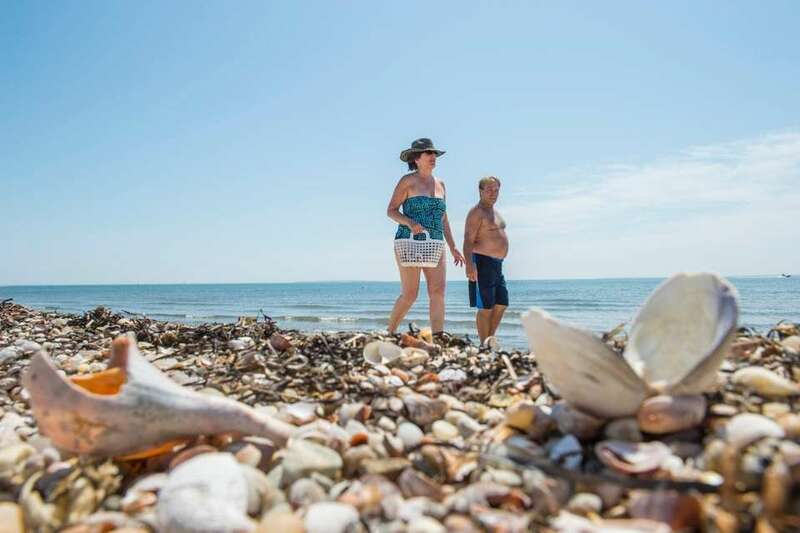 Nonresident daily beach permit costs $25, available at the beach. Nonresident beach permits are for the following three beaches only. For more information, call 631-765-5182 or visit southouldtownny.gov. NORMAN KLIPP PARK, at end of Manhasset Avenue, off Route 25, Greenport. Beach: 728 feet on harbor. Lifeguards: 11 a.m.-5 p.m. daily June 24-Sept. 4. Boat ramp (with parking permit), playground. Annual parking permit $10 for town residents, available at Town Hall, 8 a.m.-4 p.m. weekdays or by mail, or at southoldtownny.gov, $150 for nonresidents, available at Town Hall. 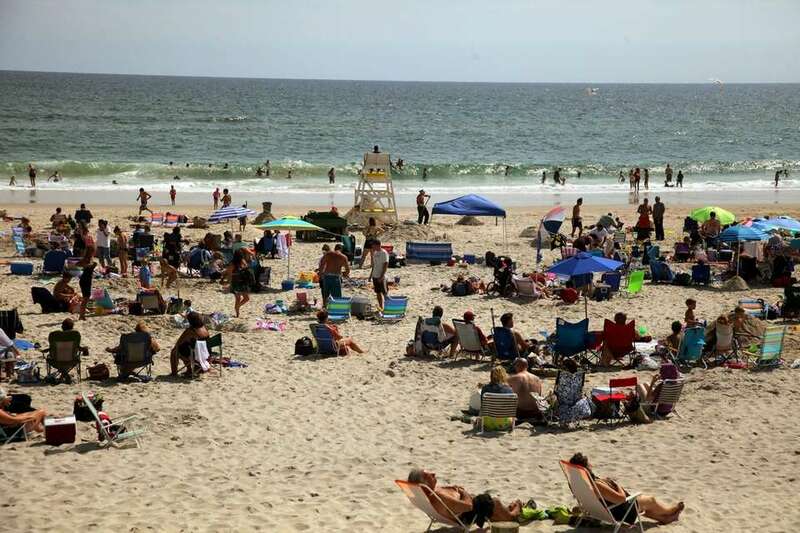 Nonresident daily beach permit costs $25, available at the beach. Nonresident beach permits are for the following three beaches only. For more information, call 631-765-5182 or visit southouldtownny.gov. NORTH HEMPSTEAD BEACH PARK, 175 W, Shore Rd., Port Washington, northhempsteadny.gov, 516-869-6311. Beach: ¾-mile on Hempstead Harbor, off the Sound. Lifeguards: 10 a.m.-6 p.m. Memorial Day weekend-Labor Day. Bathhouse, basketball, shuffleboard, bocce, volleyball, 2 playgrounds, fishing pier, boat ramp, picnic areas (permit required). Sun. concerts (1 p.m.). Fee: Parking fees apply Memorial Day-Labor Day, call or check website. 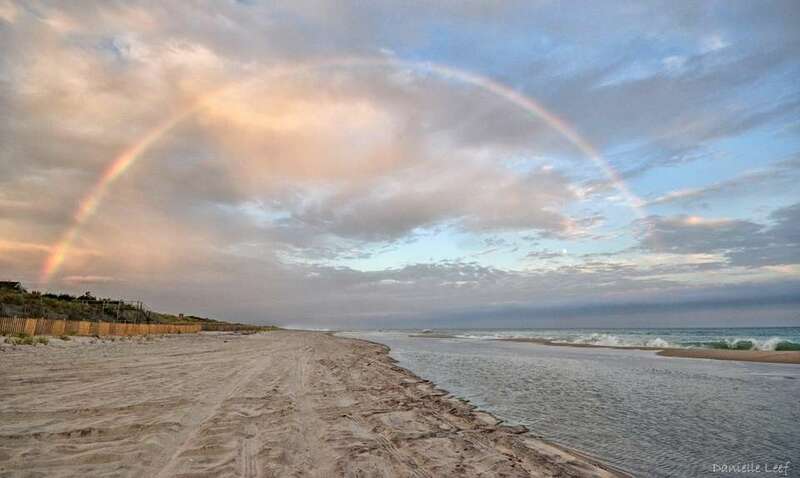 OCEAN BEACH, Fire Island, 631-583-5940. Lifeguards: May 27-June 26, weekends only; daily June 27- Labor Day, 9 a.m.-5 p.m. You may not eat or drink on the beach, no pets allowed. Fee: Accessible only by ferry, adult fare $10 one way, $19 round trip (1 a.m. ferry, adult one way $19); ages 2-12 fare $5 one way, $9 round trip. LONG BEACH, Entrances between Nevada Avenue and Maple Boulevard, Long Beach, 516-431-1021, longbeachny.gov. Beach: 4 miles on ocean, with 2.2-mile boardwalk. Lifeguards: 9 a.m.-6 p.m. weekends May 27- June 18, daily June 24-Sept. 4. Boardwalk, restrooms, concession stands, food trucks, playgrounds, fishing pier, boat ramp, free summer concerts, arts and crafts festivals, swim competitions, beach biathlons, races, volleyball, tennis. ORIENT BEACH STATE PARK, 40000 Main Rd. (Route 25), Orient, 631-323-2440, nysparks.com. 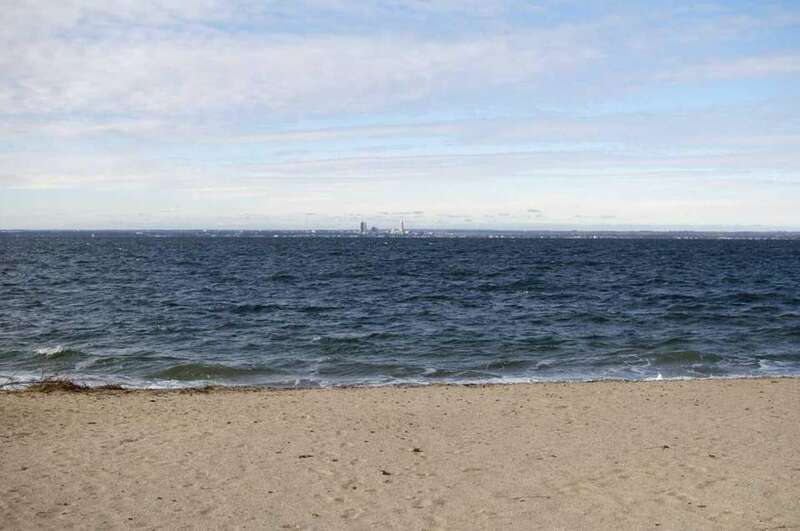 Beach: 300-foot swimming area on Gardiners Bay. Lifeguards: 10:30 a.m.-6 p.m. June 24-Labor Day. Playground, picnic areas with barbecues, 2 sand wheelchairs, pavilion (rentals available), gazebo. Fee: $10 a car daily June 24- Labor Day; $8 a car holidays May 27-June 23, weekends and holidays Sept. 9-Columbus Day weekend. For more, see State Parks. 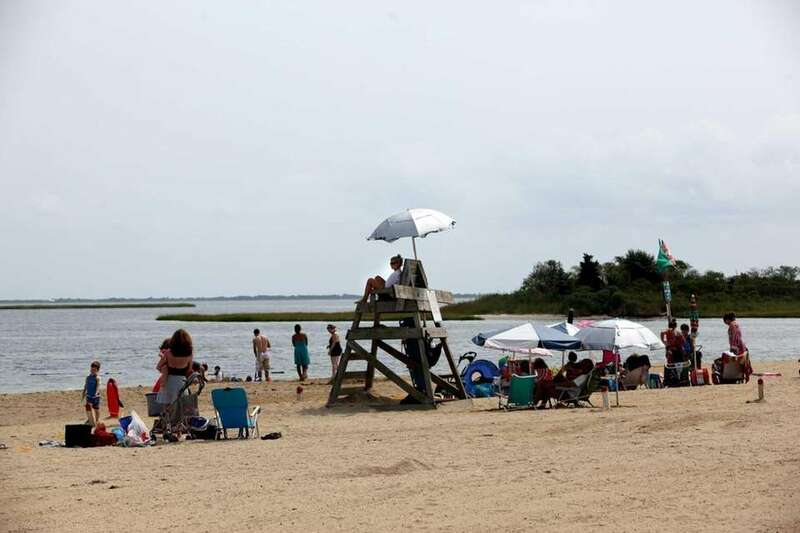 OVERLOOK BEACH, Ocean Parkway, Babylon, 631-893-2100, townofbabylon.com Beach ¾ mile on ocean. Lifeguards 10 a.m.-6 p.m. weekends May 27-June 18; 9 a.m.-7 p.m. daily June 24-Sept. 4. Babylon residents only with recreational pass. Food stand, picnic area, showers, playground, surf casting. Residents can buy an annual recreational pass at Cedar Marina on Ocean Parkway, Phelps Lane Park in North Babylon (May 10-June 23) or Tanner Park in Copiague after June 24; 631-893-2100 or townofbabylon.com for prices and times. 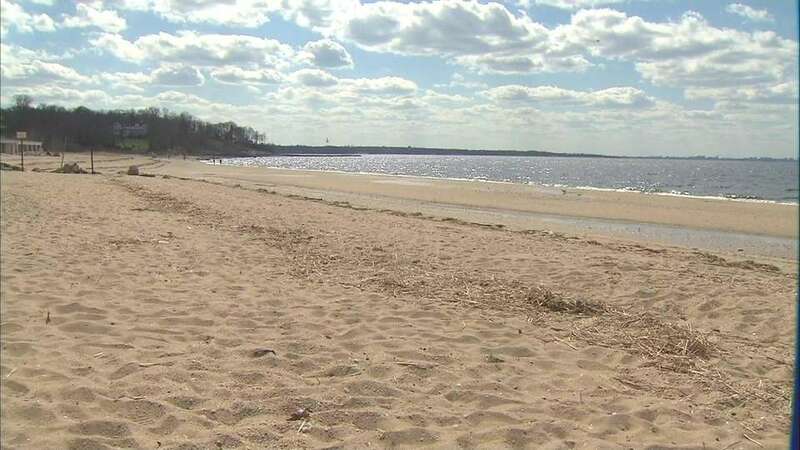 PHILIP B. HEALEY BEACH, at Florence Avenue, Massapequa, 516-797-7994, oysterbaytown.com. Lifeguards: 9 a.m.-5 p.m. weekends and holidays May 27-June 18, daily June 24-Sept. 4. Bathing in South Oyster Bay, picnic area, playground, spray park. Town of Oyster Bay residents only. For fees, call the Beach Division at 516-797-4110 or check website. PIKES BEACH, off Dune Road, Westhampton Dunes, whdunes.org. Beach: 400 feet on the ocean. Lifeguards: 10:30 a.m.-5 p.m. daily June 25-Sept. 5. Restrooms, handicapped accessible ramp, sand wheelchair. Open only to seasonal permit holders, including nonresidents. Beachgoers must obtain parking permits, sold 10 a.m.-2 p.m. Mon.-Fri. until June 24 at Town Hall, 116 Hampton Rd., Southampton. 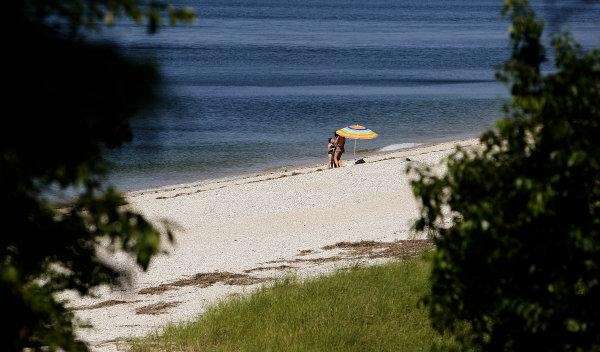 Also sold at the Parks and Recreation office, 6 Newton Rd., Hampton Bays, 8:30 a.m.-4 p.m. Mon.-Fri.; and daily beginning June 25 at town beaches. Seasonal fee is $40 for residents, $25 for residents older than 60 and $375 for nonresidents. For more information, call 631-728-8585 or visit southamptontownny.gov. PONQUOGUE BEACH, on Dune Road, Hampton Bays. Beach: 600 feet on ocean. Lifeguards: 10 a.m.- 5 p.m. daily June 25-Sept. 5. Showers, volleyball courts, food stand, chair and umbrella rentals, picnic tables, restrooms, 2 sand wheelchairs. Open only to seasonal permit holders, including nonresidents. Beachgoers must obtain parking permits, sold 10 a.m.-2 p.m. Mon.-Fri. until June 24 at Town Hall, 116 Hampton Rd., Southampton. Also sold at the Parks and Recreation office, 6 Newton Rd., Hampton Bays, 8:30 a.m.-4 p.m. Mon.-Fri.; and daily beginning June 25 at town beaches. Seasonal fee is $40 for residents, $25 for residents older than 60 and $375 for nonresidents. For more information, call 631-728-8585 or visit southamptontownny.gov. PRYIBIL BEACH, at end of East Beach Road off Lattingtown Road. Beach: 500 feet on the Sound. Lifeguards: 10 a.m.-6 p.m. weekends May 27-June 18, daily June 19-Sept. 4. 2 volleyball courts, basketball court, playground, picnic tables, food concessions and beach ramps. Swim lessons available. QUENTIN SAMMIS/WEST NECK BEACH, off West Neck Road, Lloyd Harbor, 631-261-7574. 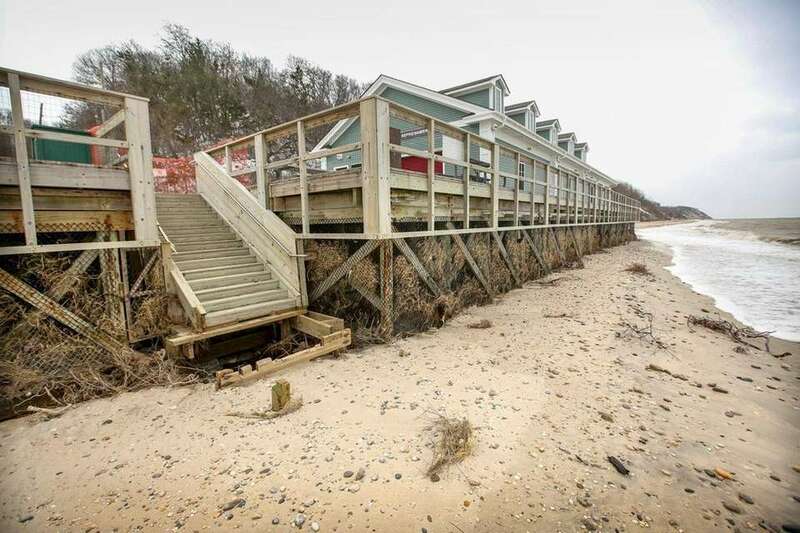 Beach: 1,140 feet on Cold Spring Harbor. Lifeguards: May 27- Sept. 4, daily 10 a.m.-6 p.m. Aid station, outdoor shower, car-top launching (no motors), small-boat racks (fee) and swim lessons (fee). Seasonal parking permits for town residents are $40 at beach entrances. Free permits available to 60 and older at Centerport Beach. Without permit, daily parking is $25 for residents, $35 nonresidents. Boat ramps at beaches are for residents only; $30 per boat for season (plus beach permit). REEVES PARK BEACH, at end of Park Road, off Sound Avenue, Riverhead. Beach: 240 feet on the Sound. Lifeguards: 10 a.m.-5 p.m. weekends May 27-June 25; then daily June 26-Sept. 4. Restrooms, swim lessons (fee). Town residents pay a seasonal $15 fee ($5 seniors) for a beach permit. Nonresidents pay $200 seasonally or $35 per vehicle per day. Buy stickers at Recreation Department or beach entrances. Details: riverheadrecreation.net or 631-727-4444; proof of residency required. ROBERT MOSES STATE PARK, Robert Moses Causeway, western end of Fire Island, 631-669-0449, nysparks.com. Beach: 5 miles on ocean. Lifeguards: Call. 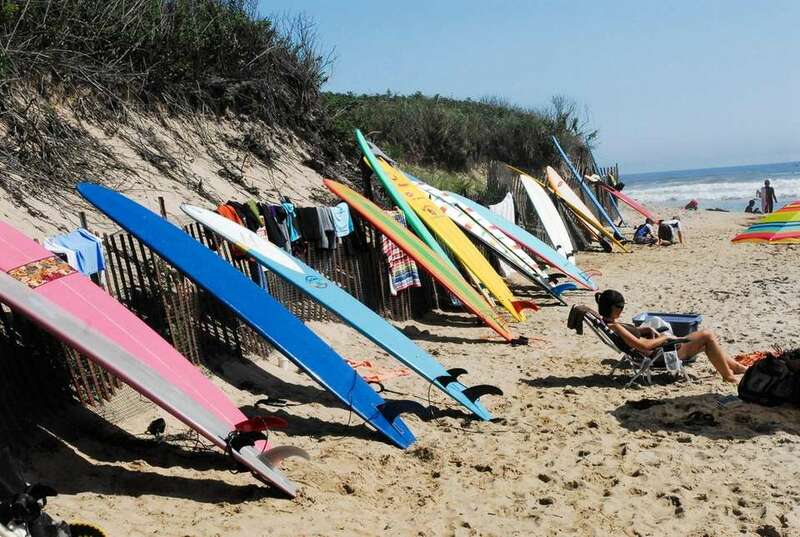 Field 5 open all year, beach shop, umbrella rentals, bathhouses, fishing (night fishing to Dec. 31, by permit), sand wheelchairs, specially equipped playground (Field 5), body-boarding areas, surfing areas (unprotected), first-aid stations. 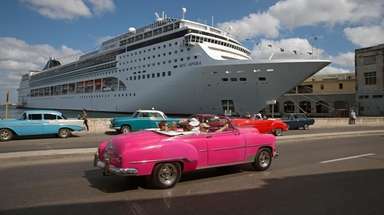 Fee: $10 a car daily May 27-Sept. 10; $8 a car weekends and holidays April 1-May 21 and Sept. 16-Nov. 12. For more, see State Parks. 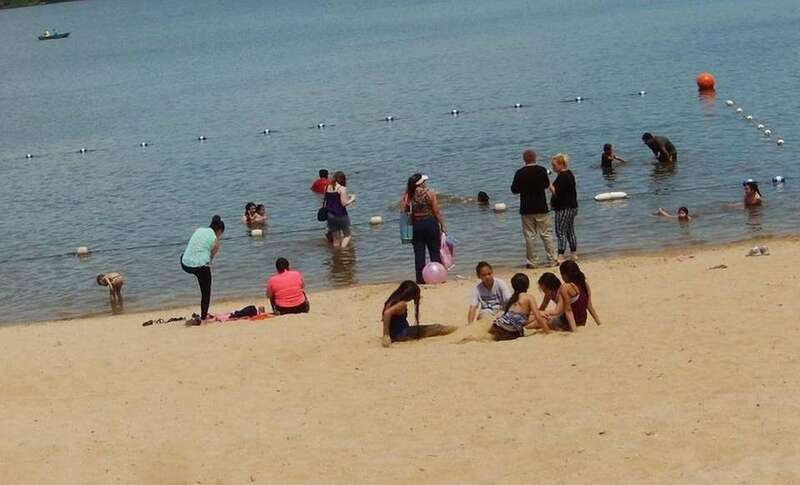 RONKONKOMA BEACH, Rosevale Avenue, Lake Ronkonkoma, 631-467-3308 Beach: 150 yards on lake. Lifeguards: Call. Basketball and handball courts, tennis courts, picnic area, outdoor showers, playgrounds, summer camp (fee). Free to Islip residents with a recreation card, disabled town card, or senior ID card. Residents without a card and nonresidents pay a daily fee per car. Residents 13 and older must have an Islip recreation card (call for fees). Resident seniors older than 60 need only a county senior citizen card. For more on the disabled town card, call 631-224-5431. For more about facilities, visit the website islipny.gov, or call the Parks Department at 631-224-5411. No swimming allowed unless a lifeguard is on duty. SAGG MAIN BEACH, on Sagg Main Road, Sagaponack. Beach: 1,500 feet on ocean. Lifeguards: 10 a.m.-5 p.m. daily June 25-Sept. 5. Showers, restrooms, overlook platform, food stand, sand wheelchair, picnic tables, volleyball courts. Open only to seasonal permit holders, including nonresidents. Beachgoers must obtain parking permits, sold 10 a.m.-2 p.m. Mon.-Fri. until June 24 at Town Hall, 116 Hampton Rd., Southampton. Also sold at the Parks and Recreation office, 6 Newton Rd., Hampton Bays, 8:30 a.m.-4 p.m. Mon.-Fri.; and daily beginning June 25 at town beaches. Seasonal fee is $40 for residents, $25 for residents older than 60 and $375 for nonresidents. For more information, call 631-728-8585 or visit southamptontownny.gov. SAILORS HAVEN BEACH, Fire Island National Seashore reached by ferry from Sayville, nps.gov/fiis/planyourvisit/sailorshaven.htm, 631-597-6183. Beach: Oceanfront, 5-minute walk from marina. 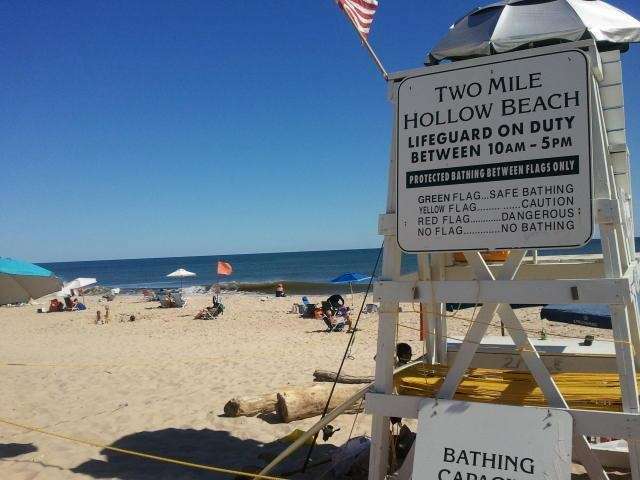 Lifeguards on weekends Memorial day through July 4 and daily July 4 through Labor Day. Visitor center, restrooms, showers, snack bar, boardwalk trail through globally rare Sunken Forest, weekend ranger-guided Sunken Forest tours. 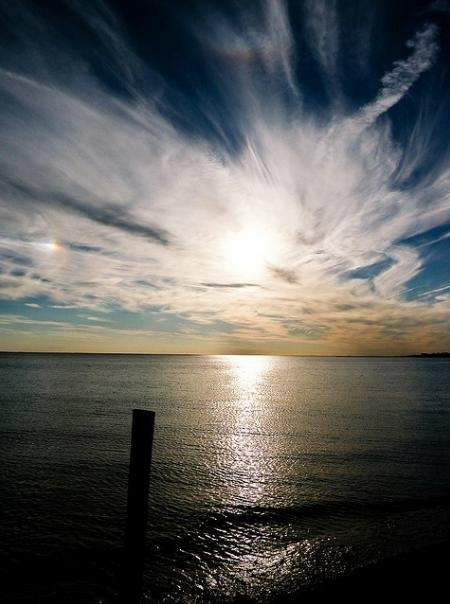 SAYVILLE MARINA PARK BEACH, Foster Avenue, Sayville, 631-224-5404. Beach: 100 yards on Great South Bay. Lifeguards: Call. Playground, tennis courts, picnic area, restrooms, shower. Free to Islip residents with a recreation card, disabled town card, or senior ID card. Residents without a card and nonresidents pay a daily fee per car. Residents 13 and older must have an Islip recreation card (call for fees). Resident seniors older than 60 need only a county senior citizen card. For more on the disabled town card, call 631-224-5431. For more about facilities, visit the website islipny.gov, or call the Parks Department at 631-224-5411. No swimming allowed unless a lifeguard is on duty. SHELL BEACH, Oak Tree Lane. Lifeguards: None. Beach: 3⁄4 miles on a peninsula. Parking permit required, no amenities, parts of the beach are protected nature areas. Beach parking restricted to residents, renters and hotel guests. Ten passes can be issued each day for nonresidents for Shell Beach and Wades Beach only. All vehicles parked at beaches must display a parking permit May 26-Sept. 4. Parking permits are available at the town clerk's office Mon.-Fri., 9 a.m.-4 p.m., and Sat. mornings, 9-noon, June 17-Aug. 26. 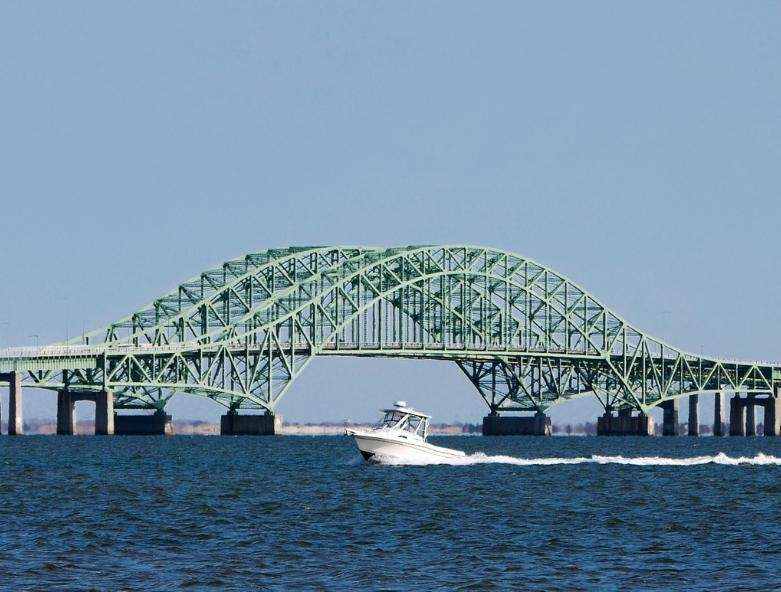 Day passes $25 per vehicle; weekly permits $50 per vehicle; monthly permits $95 per vehicle; season permits $230 per vehicle; 631-749-1166, shelterislandtown.us or email townclerk@shelterislandtown.us. SHIRLEY BEACH, 19 Grandview Drive, Shirley. Beach: 500 feet on the Great South Bay. Lifeguards: 10:30 a.m.- 6:30 p.m. July 1-4, then weekends only July 8-Labor Day. Restrooms, picnic area with grills, playground. Resident parking is $5 daily, $15 seasonal ($10 before Memorial Day weekend), $5 for seniors, veterans and handicapped when purchased in advance. Nonresident parking at Sound and bay beaches $20 daily; $100 for week, $250 for season. Ocean beaches are on Fire Island side of Great South Bay and accessible by ferry or boat. For more information, call 631-451-8696 or visit brookhavenny.gov. SHOREHAM BEACH, North Country Road, Shoreham. Beach: 600 feet on the Sound. Lifeguards: 10:30 a.m.-6 p.m. July 1-4, then weekends only July 8-Labor Day. Aid station. Resident parking is $5 daily, $15 seasonal ($10 before Memorial Day weekend), $5 for seniors, veterans and handicapped when purchased in advance. Nonresident parking at Sound and bay beaches $20 daily; $100 for week, $250 for season. Ocean beaches are on Fire Island side of Great South Bay and accessible by ferry or boat. For more information, call 631-451-8696 or visit brookhavenny.gov. SHORT BEACH, Off Boney Lane, Nissequogue. Beach: 300 feet on Smithtown Bay. Lifeguards: 9 a.m.-5 p.m. weekends beginning May 27, then daily late June-Labor Day. Playground, showers, sand chair available, beach ramp, food stand, picnic area, pavilion. 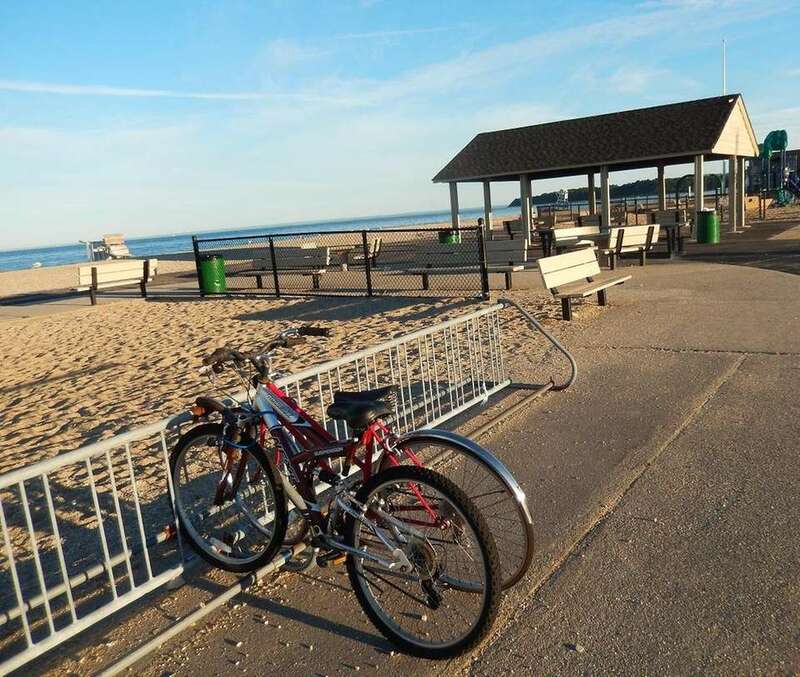 Beaches are for town residents, who can obtain free stickers at Town Hall or the Department of Parks, 100 E. Main St. (Route 25A), Kings Park, and at beaches in season. Call 631-269-1122 or visit smithtownny.gov for more information. SMITH POINT COUNTY PARK, County Road 46, Shirley, 631-852-1313, suffolkcountyny.gov/parks. Beach: 5 miles protected. Lifeguards: 10 a.m.- 5:30 p.m. May 27-Sept. 4. Campsites, saltwater fishing, camping, sand wheelchair, picnic areas, snack bar, accessible playground. Home of TWA 800 memorial. Fee: Parking daily May 27-Sept. 4: $18 nonresidents, $9 residents with Green Key card; seniors free weekdays, $9 weekends with Green Key card. SOUTH JAMESPORT BEACH, off Peconic Bay Boulevard, South Jamesport. Beach: 3,000 feet on Peconic Bay; shallow water. Lifeguards: 10 a.m.- 5 p.m. weekends May 27-June 25; then daily June 26-Sept. 4. 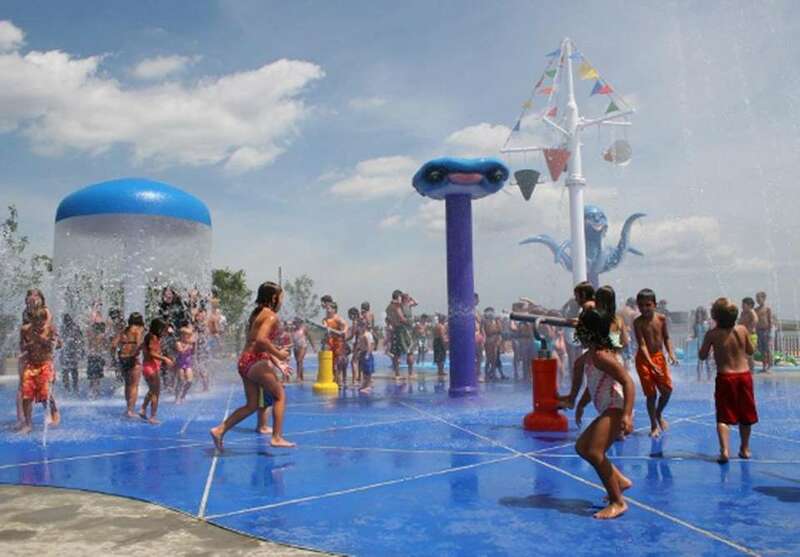 Playground, bathhouse, outdoor showers, food stand, fishing, tennis courts, picnic area, basketball court, swim lessons (fee). 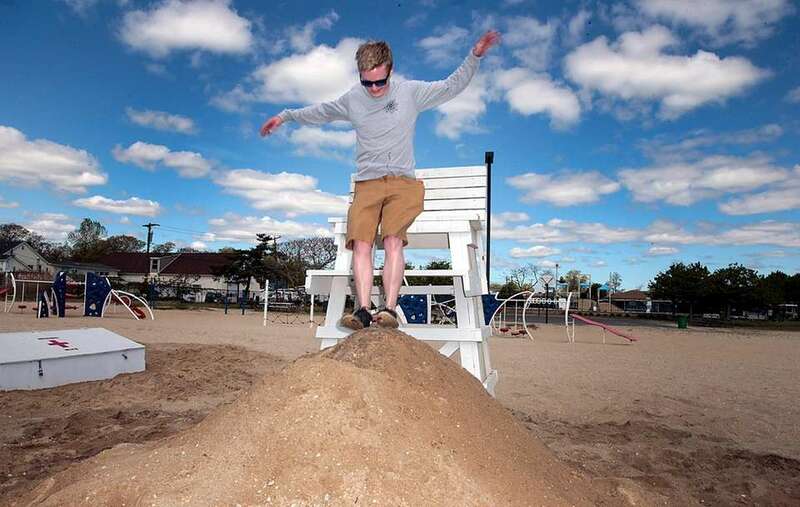 Town residents pay a seasonal $15 fee ($5 seniors) for a beach permit. Nonresidents pay $200 seasonally or $35 per vehicle per day. Buy stickers at Recreation Department or beach entrances. Details: riverheadrecreation.net or 631-727-4444; proof of residency required. SOUTHOLD TOWN BEACH, Route 48, Southold. Beach 960 feet on the Sound. Lifeguards: 11 a.m.-5 p.m. daily June 24-Sept. 4. Boat ramp, playground. Lifeguards: 11 a.m. to 5 p.m. daily June 24-Sept. 4. Annual parking permit $10 for town residents, available at Town Hall, 8 a.m.-4 p.m. weekdays or by mail, or at southoldtownny.gov, $150 for nonresidents, available at Town Hall. Nonresident daily beach permit costs $25, available at the beach. Nonresident beach permits are for the following three beaches only. For more information, call 631-765-5182 or visit southouldtownny.gov. STEHLI BEACH, Bayville Road, Bayville, 516-624-6125, oysterbaytown.com. Lifeguards: 9 a.m.-5 p.m. daily June 24-Sept. 4. Town residents only. For fees, call the Beach Division at 516-797-4110 or check website. STONY BROOK BEACH, Sand Street, Stony Brook. Beach: 225 feet on the Sound. Lifeguards: 10:30 a.m.-6 p.m. Weekends and holidays only July 1-Sept. 4. Restrooms. Resident parking is $5 daily, $15 seasonal ($10 before Memorial Day weekend), $5 for seniors, veterans and handicapped when purchased in advance. Nonresident parking at Sound and bay beaches $20 daily; $100 for week, $250 for season. Ocean beaches are on Fire Island side of Great South Bay and accessible by ferry or boat. For more information, call 631-451-8696 or visit brookhavenny.gov. TANNER PARK, Kerrigan Road off Montauk Highway, Copiague, 631-893-2100, townofbabylon.com. Beach: 300 feet on Great South Bay. Lifeguards: 10 a.m.-6 p.m. June 24-Sept. 4. Basketball and tennis courts, softball field, fishing pier, boat ramp, showers, picnic area, turf field, boardwalk, spray park, free summer concerts at band shell. Residents can buy an annual recreational pass at Cedar Marina on Ocean Parkway, Phelps Lane Park in North Babylon (May 10-June 23) or Tanner Park in Copiague after June 24; 631-893-2100 or townofbabylon.com for prices and times. THEODORE ROOSEVELT MEMORIAL BEACH, Larrabee Avenue, Oyster Bay, oysterbaytown.com, 516-624-6202. Lifeguards: 9 a.m.-5 p.m. weekends and holidays May 27-June 18, daily June 24-Sept. 4. Bathing in harbor, food stand, picnic area. For fees, call the Beach Division at 516-797-4110 or check website. TIANA BEACH, off Dune Road, Hampton Bays. Beach 1,000 feet on ocean. Lifeguards: 10 a.m.- 5 p.m. daily June 25-Sept. 5. Showers, volleyball courts, food stand, picnic tables, restrooms. Open only to seasonal permit holders, including nonresidents. Beachgoers must obtain parking permits, sold 10 a.m.-2 p.m. Mon.-Fri. until June 24 at Town Hall, 116 Hampton Rd., Southampton. Also sold at the Parks and Recreation office, 6 Newton Rd., Hampton Bays, 8:30 a.m.-4 p.m. Mon.-Fri.; and daily beginning June 25 at town beaches. Seasonal fee is $40 for residents, $25 for residents older than 60 and $375 for nonresidents. For more information, call 631-728-8585 or visit southamptontownny.gov. 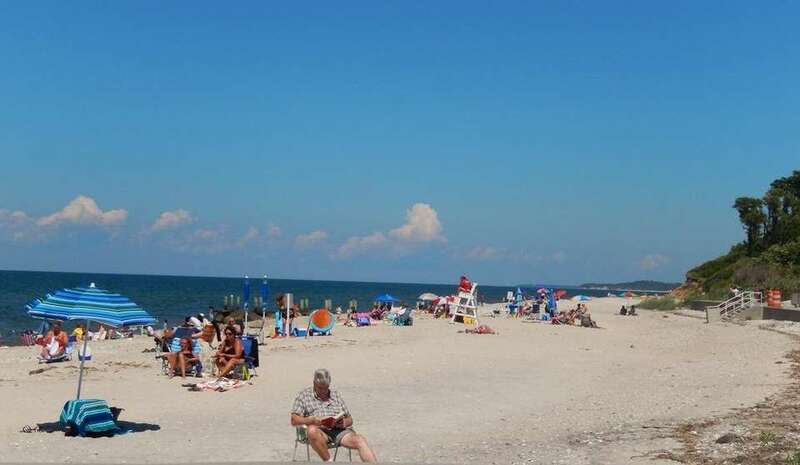 TOBAY BEACH, Ocean Parkway east of Jones Beach, off Wantagh Parkway, Massapequa, 516-679-3900, oysterbaytown.com. Beach: 2 miles on ocean, plus some bay swimming in South Oyster Bay. Lifeguards: 9 a.m.-5 p.m. weekends May 27-June 18, daily June 24-Sept. 4. Food stands, spray park, surfing and soft boarding area, picnic area. For fees, call the Beach Division at 516-797-4110 or check website. 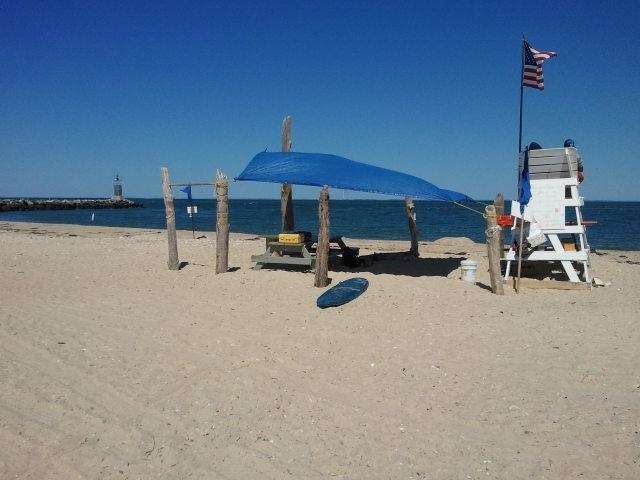 TOWN PARK AT POINT LOOKOUT, 1300 Lido Blvd., Point Lookout, toh.li/facilities/beaches-and-pools/beaches, 516-431-3900. Beach: 1,800 feet. Lifeguards: 10 a.m.-6 p.m. weekends May 27-June 18, daily June 19-Sept. 4. Food concession, picnic tables, handicap facilities, showers. Fee: $10 for town residents with proof of residency, $25 for nonresidents ($20 for nonresidents at Lido Beach Town Park). 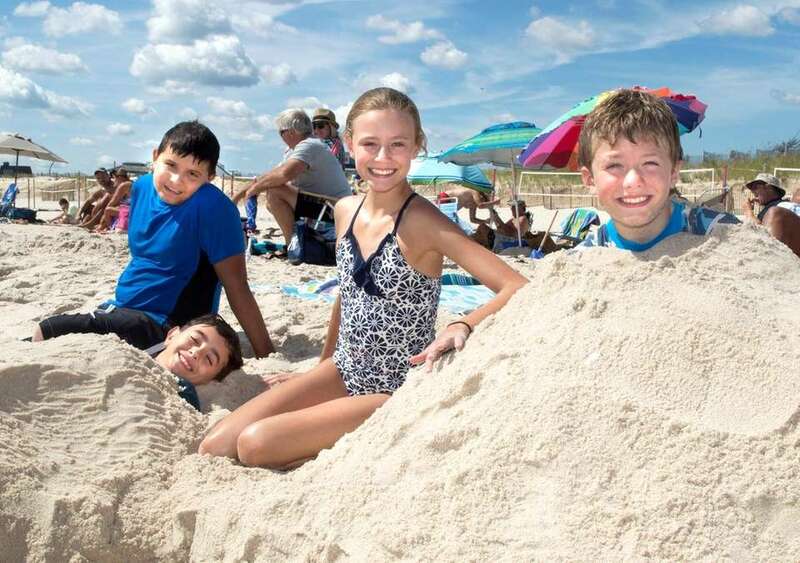 TOWN PARK AT SANDS, 710 Lido Blvd., Lido Beach, toh.li/facilities/beaches-and-pools/beaches, 516-431-6910. Beach: 380 feet. Lifeguards: 10 a.m.- 6 p.m. weekends from May 27-June 18, daily June 19-Sept. 4. Picnic gazebo (by permit only), swings, pool open June 17-Sept. 4, 11 a.m.-6 p.m. Fee: $10 for town residents with proof of residency, $25 for nonresidents ($20 for nonresidents at Lido Beach Town Park). TWO MILE HOLLOW BEACH, Two Mile Hollow Road off Further Lane, easthamptonvillage.org/ beaches.htm. Beach: On ocean. Lifeguards: 10 a.m.- 5 p.m. weekends May 27-June 30, then daily through Sept. 4, then weekends only through mid-Sept. Restroom. Seasonal parking permits: free for residents; sold out for nonresidents this year. Daily parking: $40 Mon.-Fri., except holidays, available only at Georgica and Main beaches. Weekend and holiday parking spaces limited to 40 at Georgica and 60 at Main Beach. Permits issued at Main Beach in season and Village Hall (weekdays). VENETIAN SHORES, Granada Parkway off Montauk Highway, Lindenhurst, townofbabylon.com, 631-893-2100. Beach: 1,200 feet on Great South Bay. Lifeguards: 10 a.m.-6 p.m. June 24-Sept. 4. For Babylon residents only with recreational pass; basketball and tennis courts, softball field, fishing pier, boat ramp, showers and picnic area, spray park; food, music, playgrounds, turf field. Residents can buy an annual recreational pass at Cedar Marina on Ocean Parkway, Phelps Lane Park in North Babylon (May 10-June 23) or Tanner Park in Copiague after June 24; 631-893-2100 or townofbabylon.com for prices and times. W. SCOTT CAMERON BEACH, at the end of Dune Road, Bridgehampton. Beach: 300 feet on ocean. Lifeguards: 10 a.m.-5 p.m. daily June 25-Sept 5. This residents-only beach on the Mecox Inlet features a small pavilion, picnic tables, a beach volleyball court and outdoor showers. Open only to seasonal permit holders, including nonresidents. Beachgoers must obtain parking permits, sold 10 a.m.-2 p.m. Mon.-Fri. until June 24 at Town Hall, 116 Hampton Rd., Southampton. 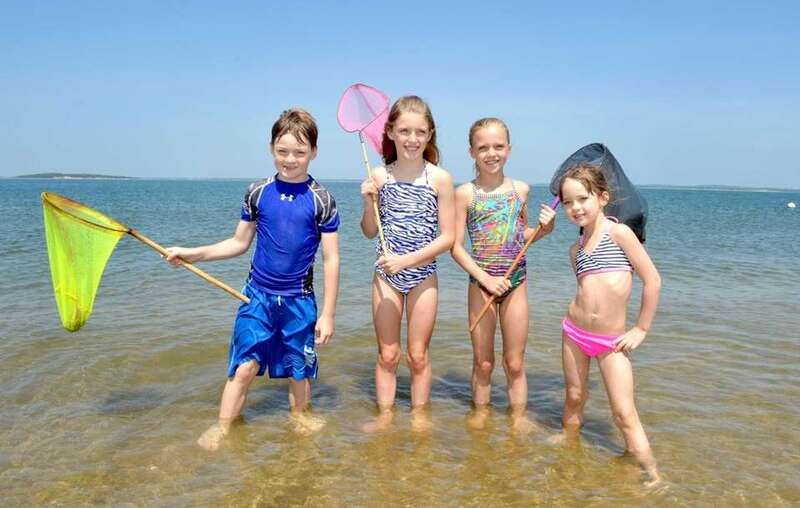 Also sold at the Parks and Recreation office, 6 Newton Rd., Hampton Bays, 8:30 a.m.-4 p.m. Mon.-Fri.; and daily beginning June 25 at town beaches. Seasonal fee is $40 for residents, $25 for residents older than 60 and $375 for nonresidents. For more information, call 631-728-8585 or visit southamptontownny.gov. WADES BEACH, off Midway Road. Beach: 500 yards on Shelter Island Sound. Lifeguards: 10 a.m.- 5 p.m. June 15- Labor Day. Restrooms. 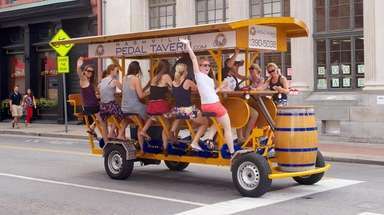 Parking permits required. Beach parking restricted to residents, renters and hotel guests. Ten passes can be issued each day for nonresidents for Shell Beach and Wades Beach only. All vehicles parked at beaches must display a parking permit May 26-Sept. 4. Parking permits are available at the town clerk's office Mon.-Fri., 9 a.m.-4 p.m., and Sat. mornings, 9-noon, June 17-Aug. 26. Day passes $25 per vehicle; weekly permits $50 per vehicle; monthly permits $95 per vehicle; season permits $230 per vehicle; 631-749-1166, shelterislandtown.us or email townclerk@shelterislandtown.us. WADING RIVER BEACH, Creek Road, Wading River. Beach: 250 feet on the Sound. Lifeguards: 10 a.m.- 5 p.m. weekends May 27-June 25; then daily June 26-Sept. 4. Playground, restaurant across street, restrooms, swim lessons (fee). Town residents pay a seasonal $15 fee ($5 seniors) for a beach permit. Nonresidents pay $200 seasonally or $35 per vehicle per day. Buy stickers at Recreation Department or beach entrances. Details: riverheadrecreation.net or 631-727-4444; proof of residency required. WATCH HILL BEACH, Fire Island National Seashore reached by Watch Hill ferry from Patchogue, nps.gov/fiis/planyourvisit/watchhill.htm, 631-475-1665. A project to replace electrical and lighting systems and adjacent bulkhead and boardwalk at the Watch Hill Marina began in Sept. The marina, visitor center, bathrooms and family tent campgrounds are closed through late summer. 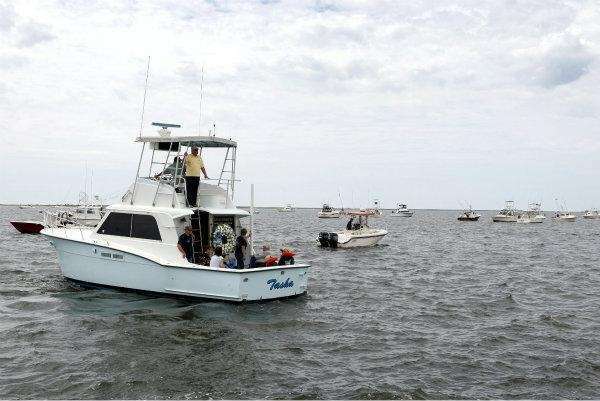 WEST ISLIP BEACH AND MARINA, Beach Drive, West Islip, 631-224-5404. Beach: 50 yards on Great South Bay. Lifeguards: Call. 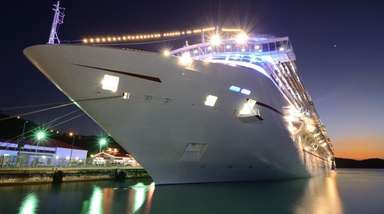 Restrooms, showers, new playground, picnic area, sailing lessons (fee). Outdoor waterfront restaurant has docking for town residents' boats. Free to Islip residents with a recreation card, disabled town card, or senior ID card. 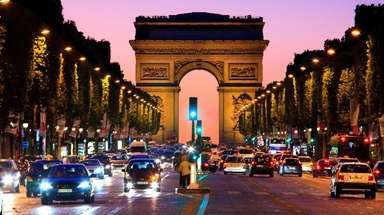 Residents without a card and nonresidents pay a daily fee per car. Residents 13 and older must have an Islip recreation card (call for fees). Resident seniors older than 60 need only a county senior citizen card. For more on the disabled town card, call 631-224-5431. For more about facilities, visit the website islipny.gov, or call the Parks Department at 631-224-5411. No swimming allowed unless a lifeguard is on duty. WEST MEADOW BEACH, West Meadow Beach Road, Stony Brook. Beach: 1,100 feet on the Sound. Lifeguards: 10:30 a.m.-6 p.m. Weekends only May 27-June 25, then daily till Labor Day. Aid station, swim lessons (fee). Resident parking is $5 daily, $15 seasonal ($10 before Memorial Day weekend), $5 for seniors, veterans and handicapped when purchased in advance. Nonresident parking at Sound and bay beaches $20 daily; $100 for week, $250 for season. Ocean beaches are on Fire Island side of Great South Bay and accessible by ferry or boat. For more information, call 631-451-8696 or visit brookhavenny.gov. WIBORG BEACH, 74 Highway Behind the Pond, off Dunemere Lane, easthamptonvillage.org/ beaches.htm. Beach: Between the Maidstone Club and Main Beach. Lifeguards: None. No restrooms; open weekends only May 27-June 30, then daily through Sept. 4, then weekends only through mid-Sept. Seasonal parking permits: free for residents; sold out for nonresidents this year. Daily parking: $40 Mon.-Fri., except holidays, available only at Georgica and Main beaches. Weekend and holiday parking spaces limited to 40 at Georgica and 60 at Main Beach. Permits issued at Main Beach in season and Village Hall (weekdays). WILDWOOD STATE PARK, 790 Hulse Landing Rd., north of Sound Avenue, Wading River, 631-929- 4314, nysparks.com. Beach: 2 miles on Long Island Sound. Lifeguards: Call. 2 sand wheelchairs, showers, campsites (800-456-CAMP to reserve), picnic area, playground. Fee: $10 a car daily June 24-Labor Day; $8 a car daily May 27- June 23. For more, see State Parks.